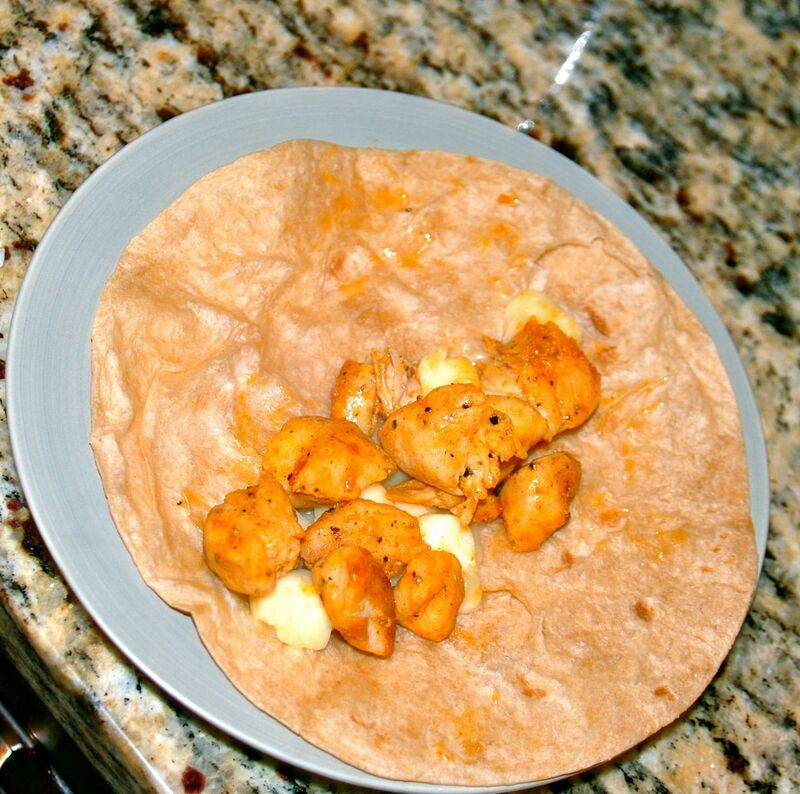 You are currently browsing the tag archive for the ‘Easy Dinner’ tag. 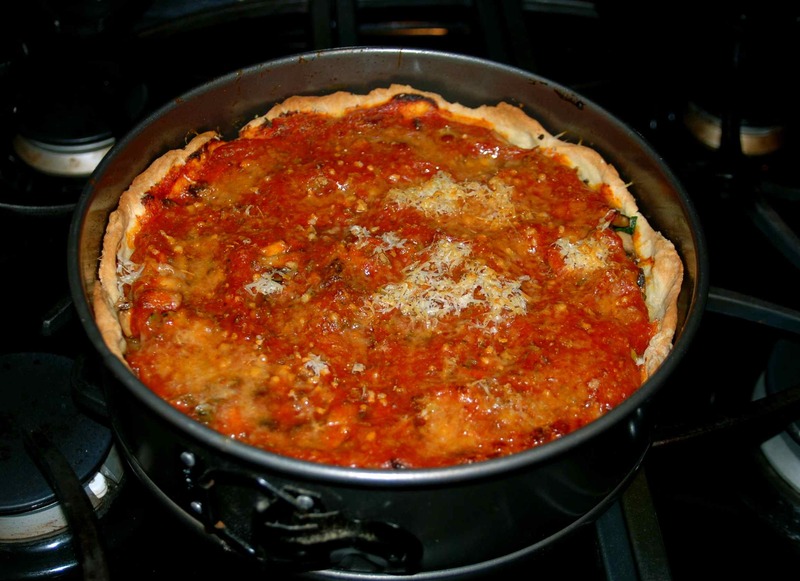 How on earth have I never made a deep dish pizza before this week? It is so super duper easy. 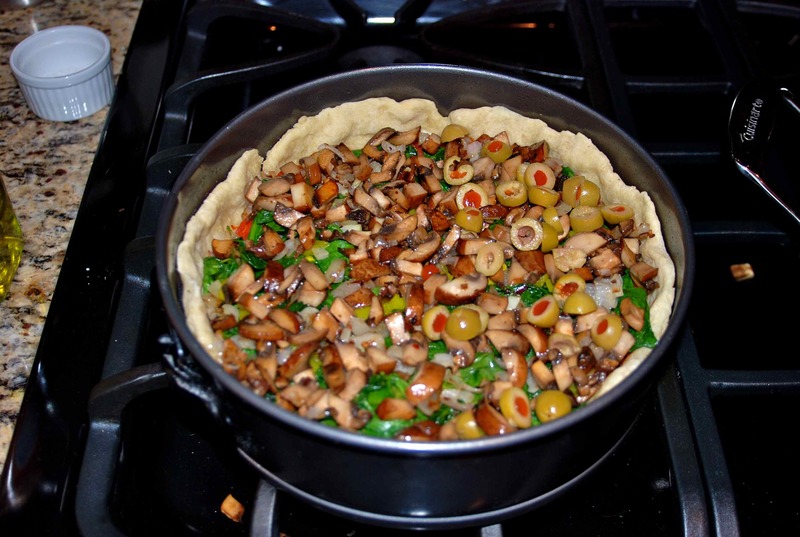 Start by preheating your oven to 475. I’m sure that this isn’t an original idea, but I felt like a genius when I thought to use a spring form pan. 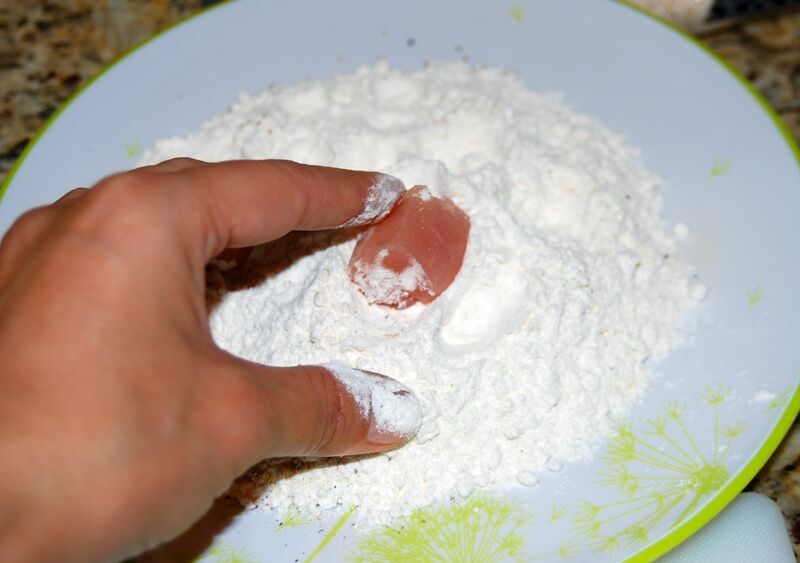 So, I used this recipe to make the pizza crust. 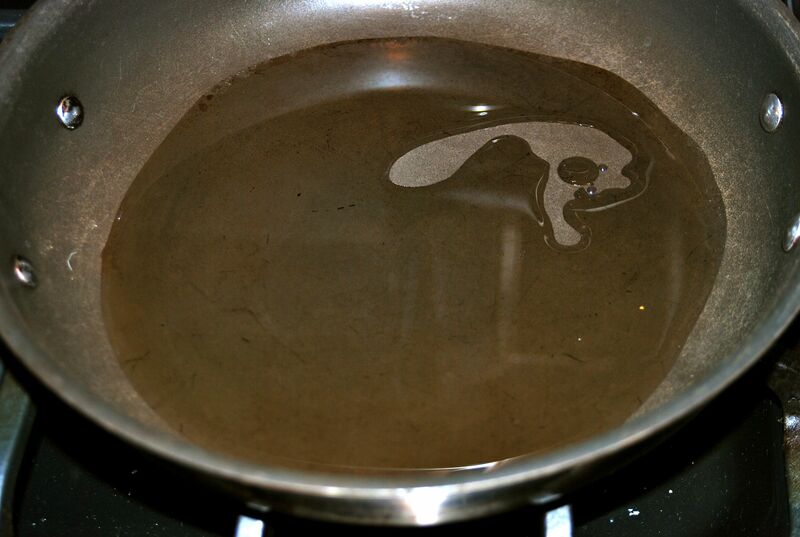 After it was done rising, I used my fingers to spread it into a non-stick sprayed pan. I popped that into the oven for about 8 minutes to just precook the crust a bit. I like a crispy, slightly browned crust. 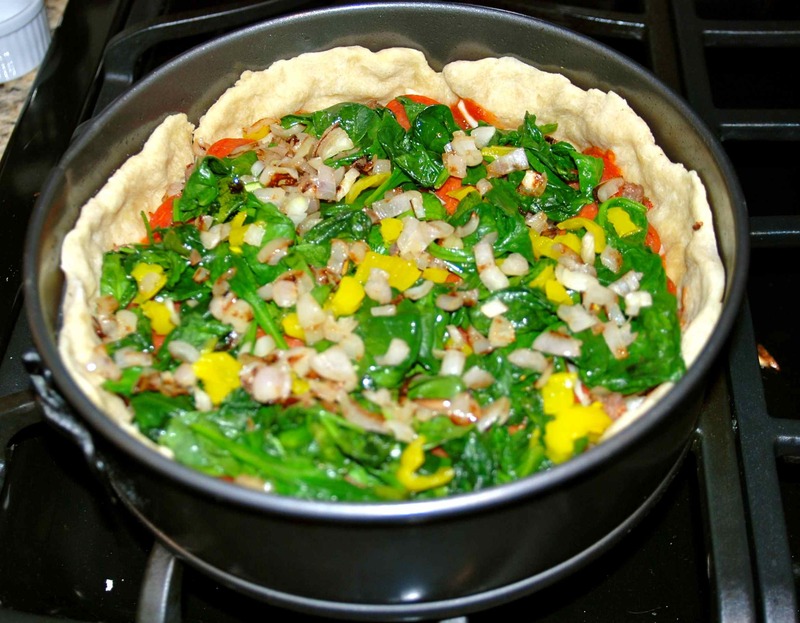 If you don’t care about a crispier crust, you can totally skip that step. 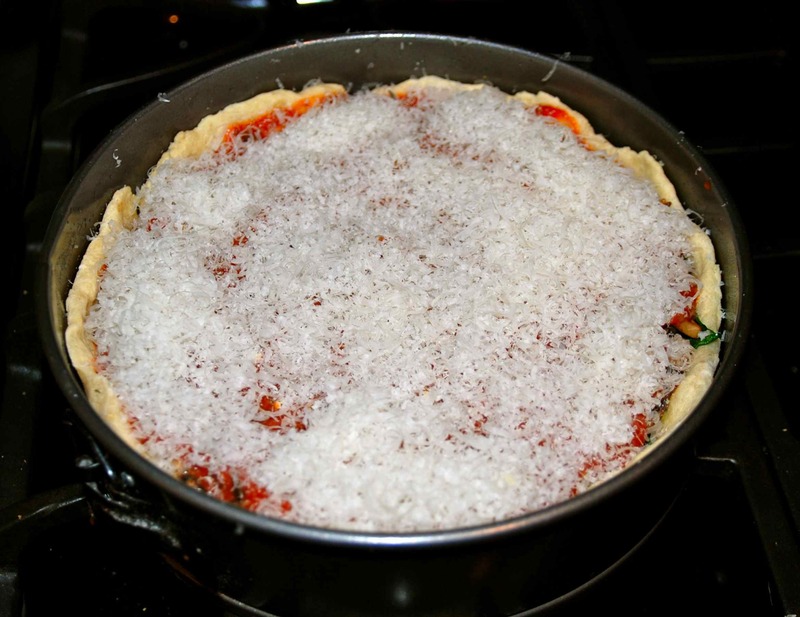 Once slightly cooked, I put a teeny bit of sauce on the bottom of the crust, and then layered on the cheese. 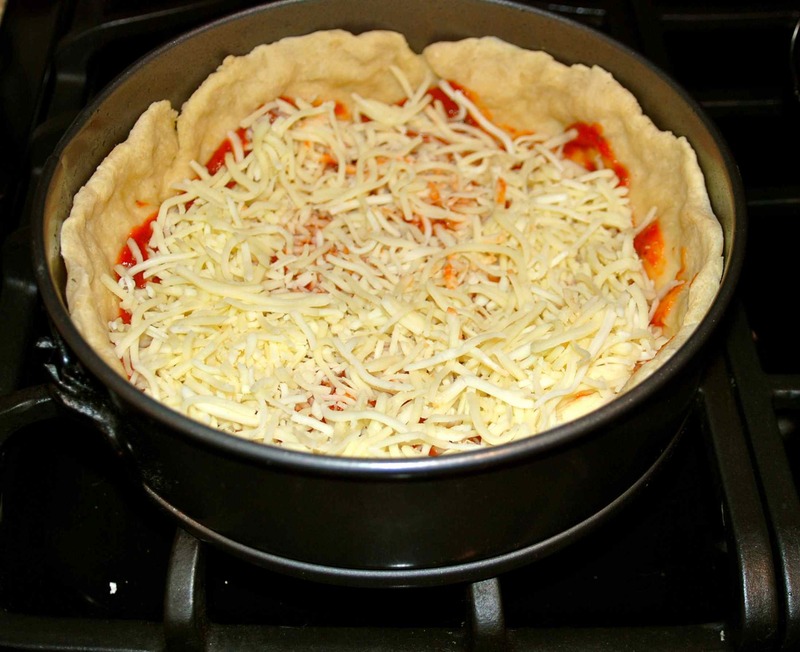 You know that cheese goes on the bottom of a deep dish pizza, right? Baked at 475 for about 25 minutes. 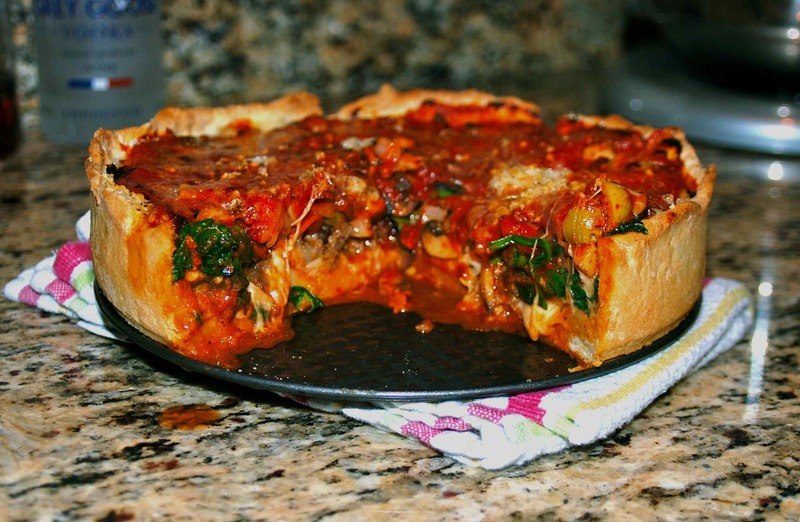 Remove your spring form pan for a perfect deep this pizza. I’m so impressed with myself! Slice out a hunk for you and one for someone special in your life. 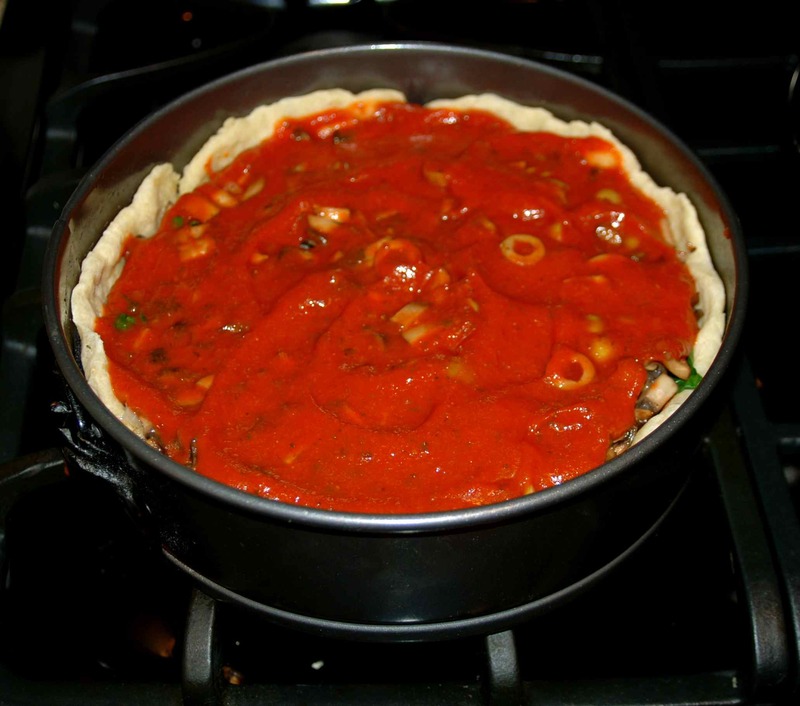 Apologize profusely for the strange color of this pizza… I don’t know how to take pictures of red things at night. 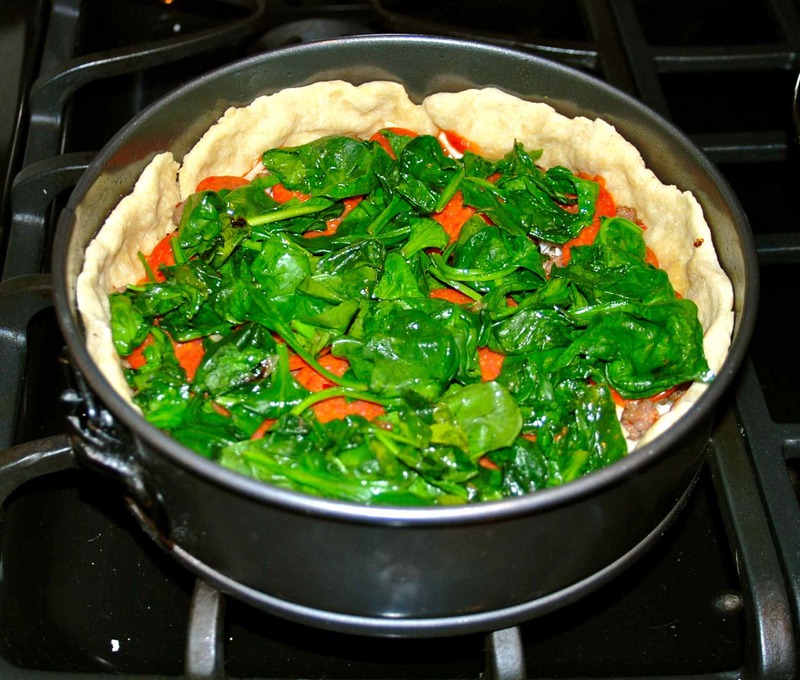 Serve it up with a green salad. 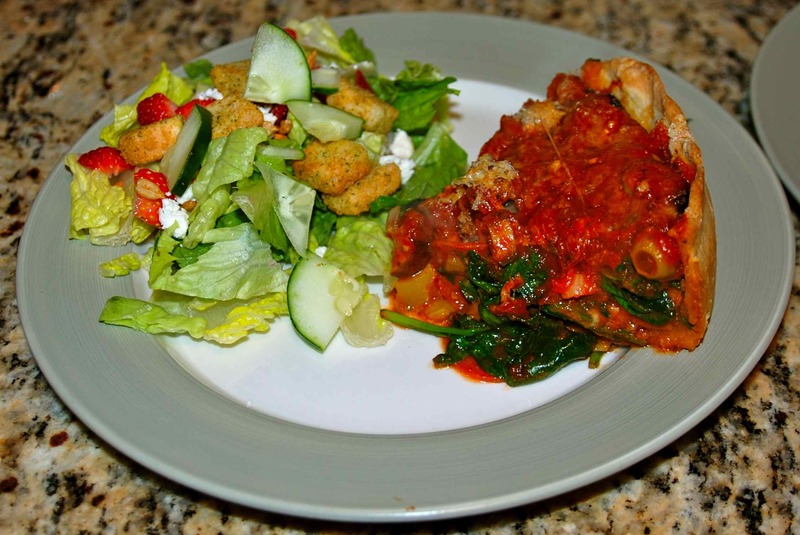 And the best part… this recipe is totally customizable by you!!! You can make it anyway you want. 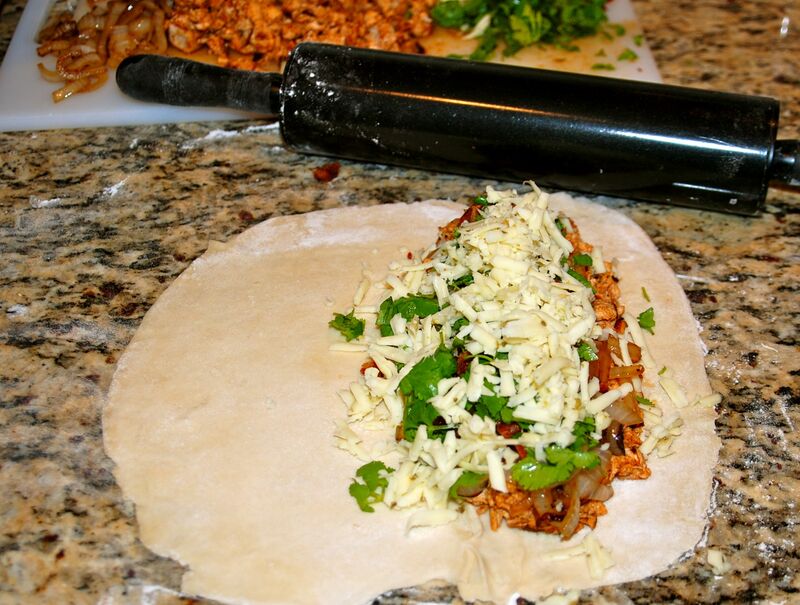 Add in or leave out any ingredient that doesn’t suit your fancy. 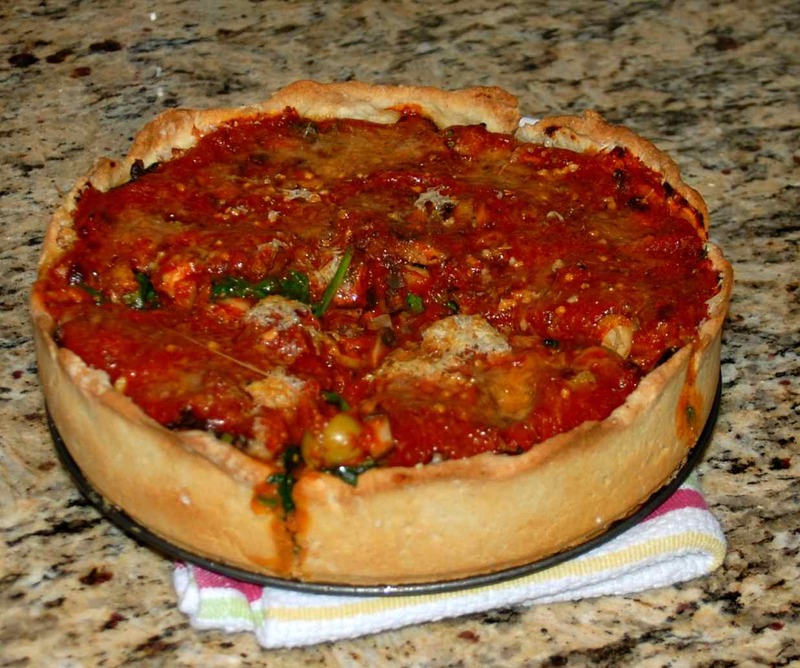 I kind of want to try a deep dish pizza that is filled with only cheese. 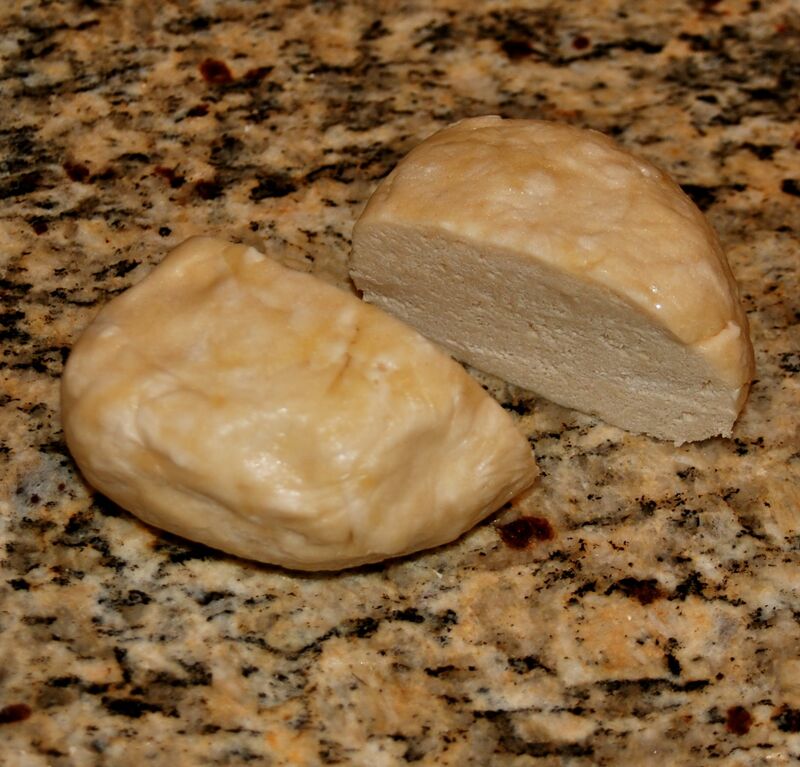 Like 5 different kinds of melty cheese. Doesn’t that sound amazing? And tomorrow is Bradley’s birthday. And those two facts make me quite happy. I’ve been on the road a bit this week. Thus, I have been a very bad blogger. And today, I’m talking barbecue. And calzones. 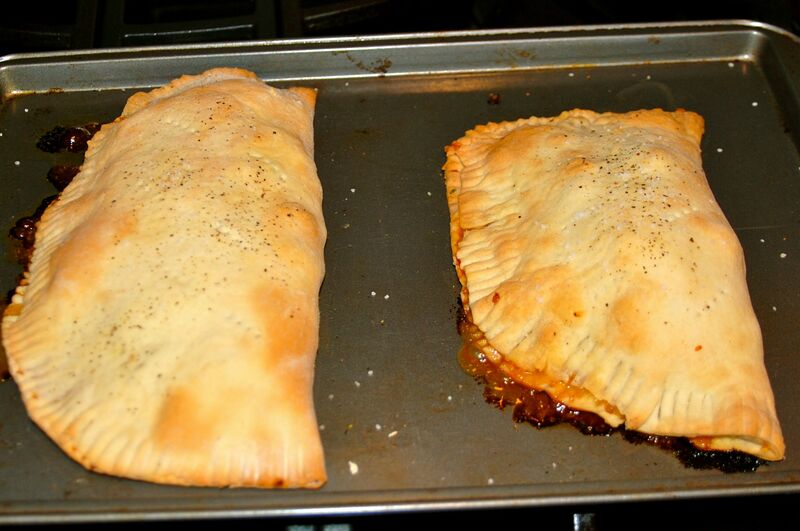 Two large chicken breasts make two large calzones. 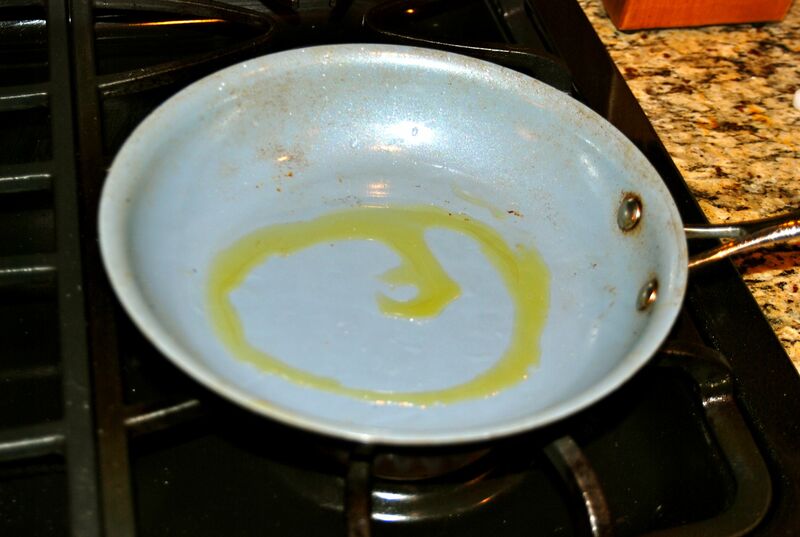 Get out a non-stick pan, and put some oil into the pan over medium-high heat. 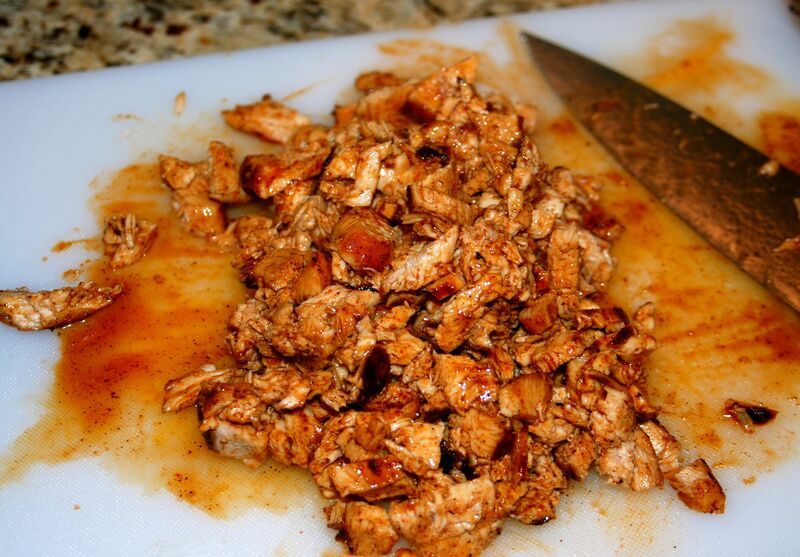 Do you have chipotle chile powder? It is chile powder made from smoked chiles. 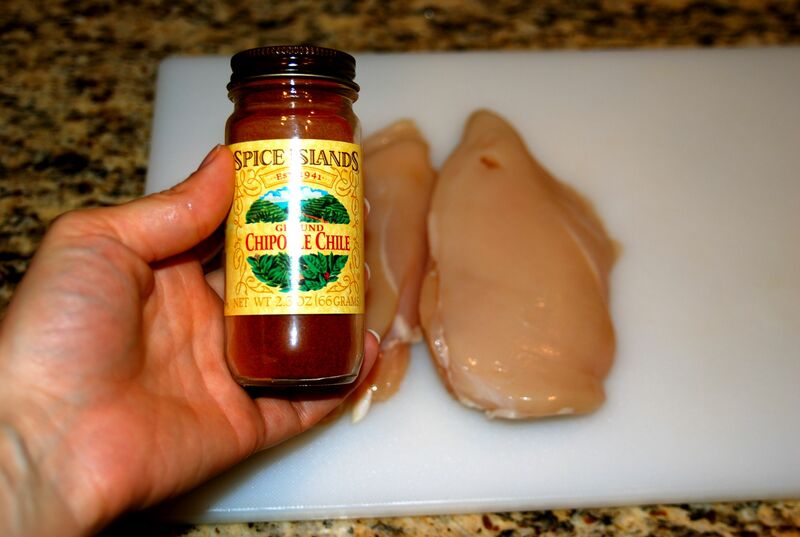 If you don’t have the chipotle chile powder, don’t fret! 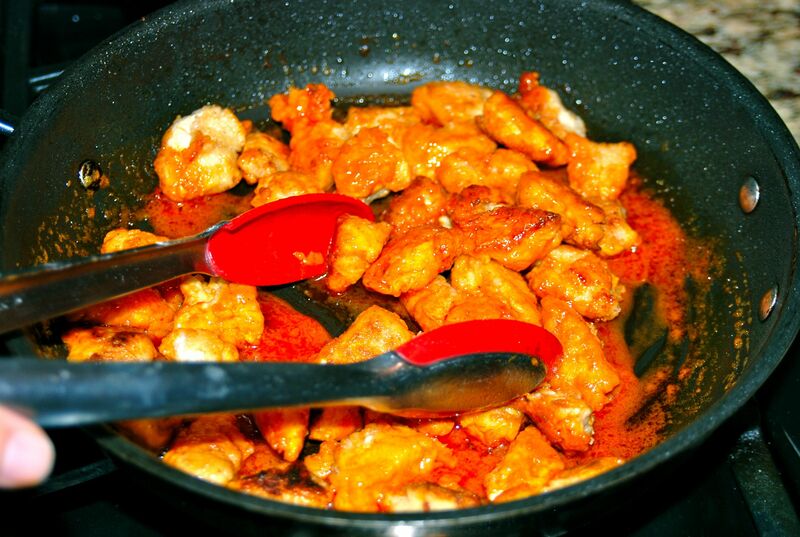 You can use plain ole chili powder. 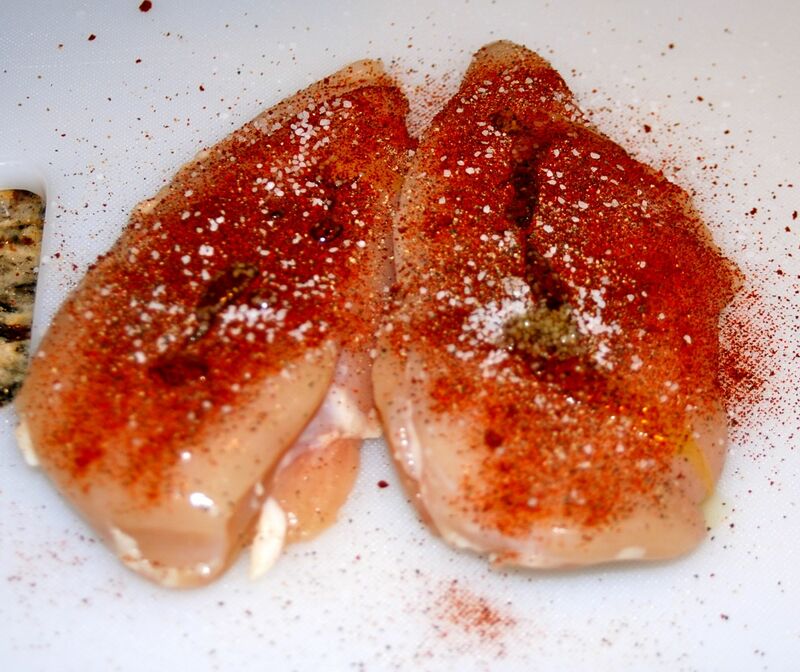 Give your chicken breasts a healthy coating of chili powder, a sprinkle of salt, and a dusting of pepper. 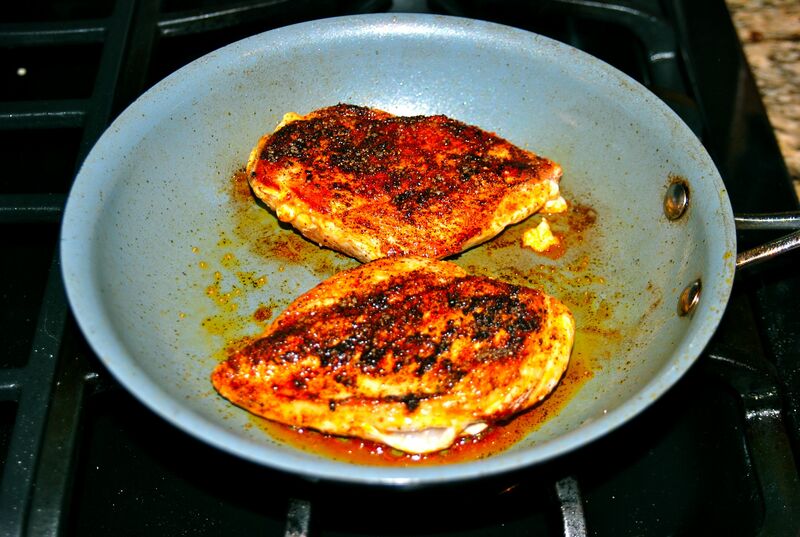 Now drizzle a tiny bit of olive oil onto the chicken breasts, and give your oil and spices a good rub. Pop those bad boys face-down into your heated pan. Warning: You may experience some coughing or a runny nose from the heat hitting the chili powder. If the weather is nice, I would recommend doing the cooking portion on the grill. However, I made these on a rainy day. 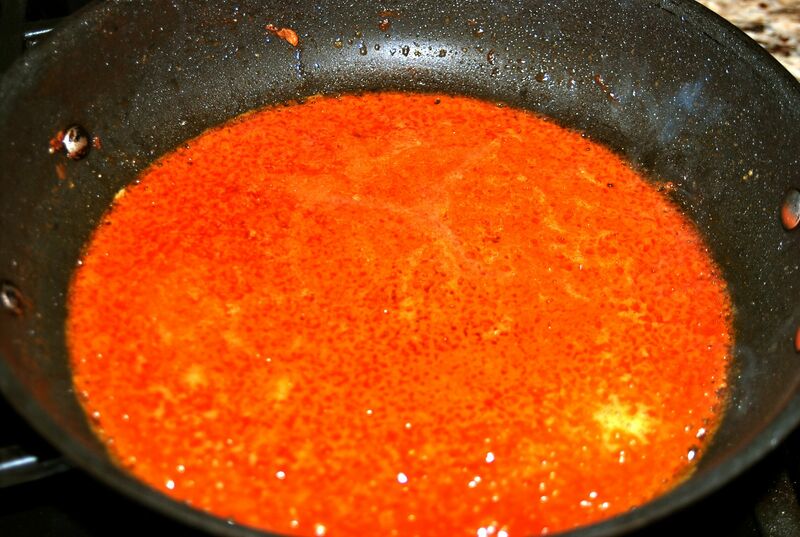 While the first side is cooking (for about 5 min), give the other side the chili, salt, and pepper treatment. 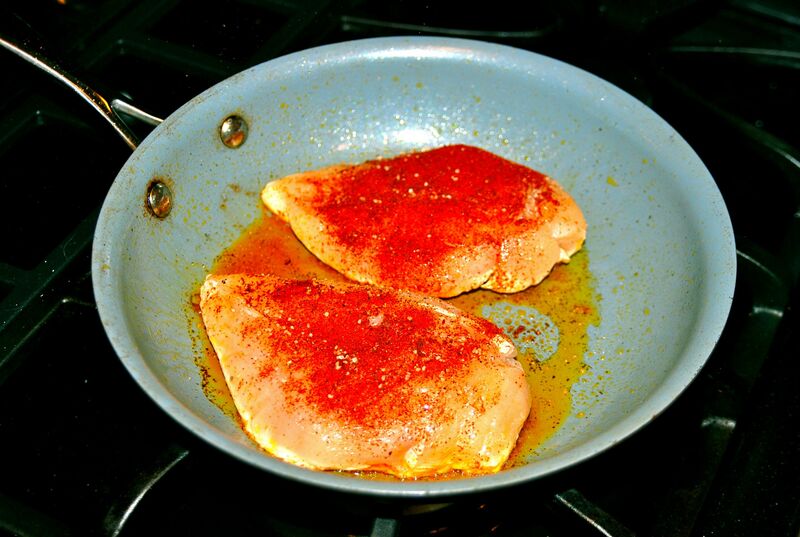 After the first side has cooked for about 5 minutes, give the breasts a flip. 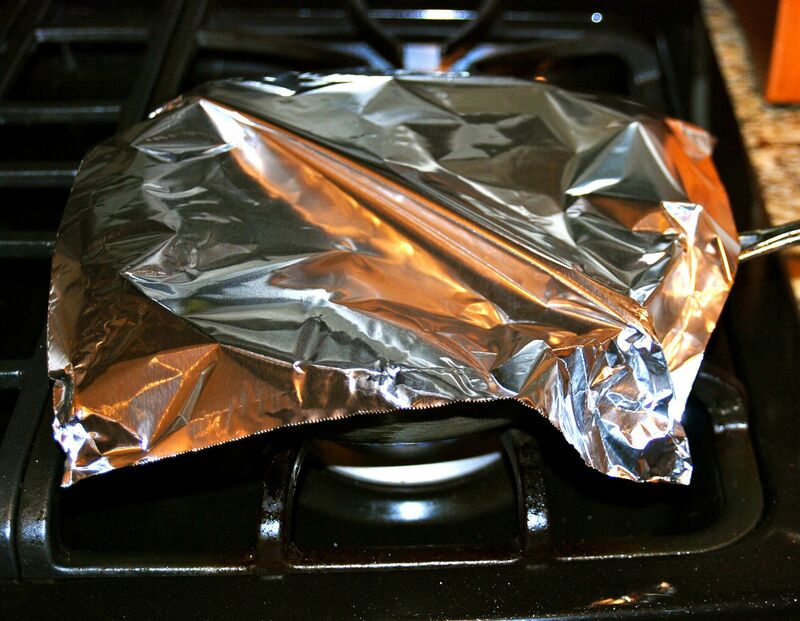 Now, cover them with foil. This helps the chicken cook through a little faster. Leave it alone to cook for 5 minutes. Meat cooks best when you don’t mess with it. Take an onion and remove the peel. 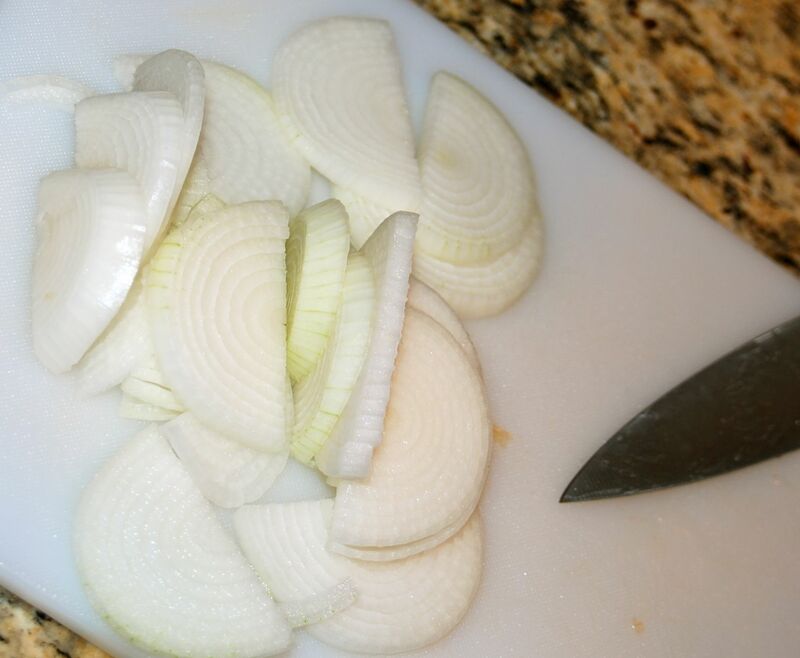 Cut the onion in half, and then slice it into half moons. 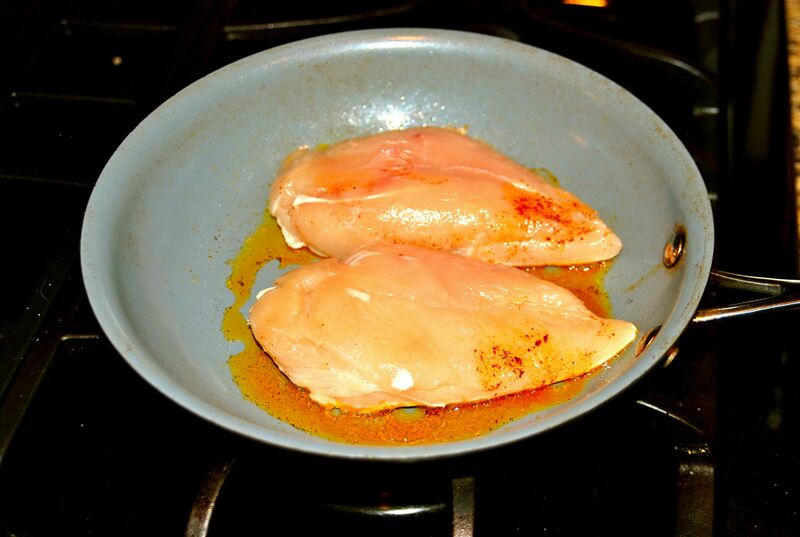 Take your chicken breasts out of the pan. 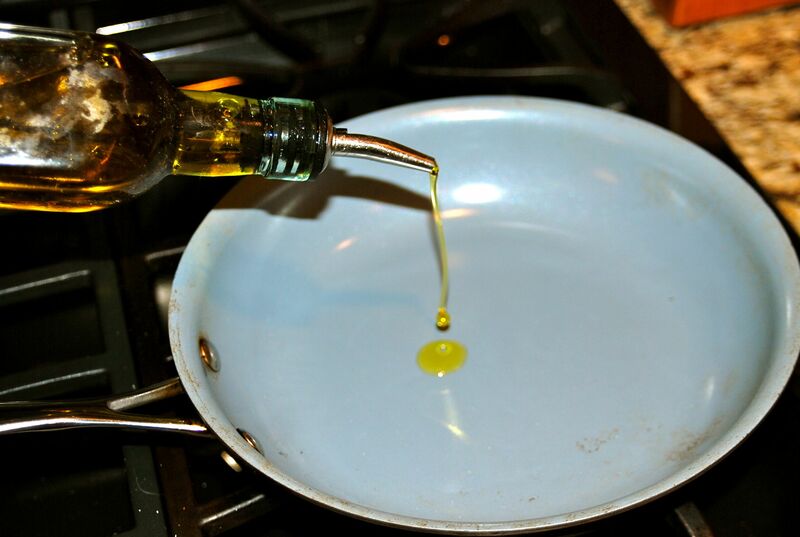 Give it a quick wipe down, then add some fresh oil (still over med-high heat). 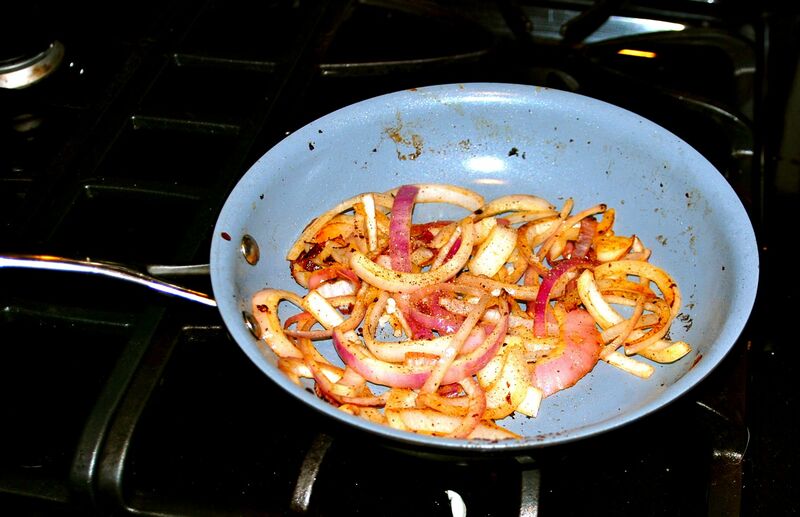 Throw your onions into the pan. I did not take a pic. 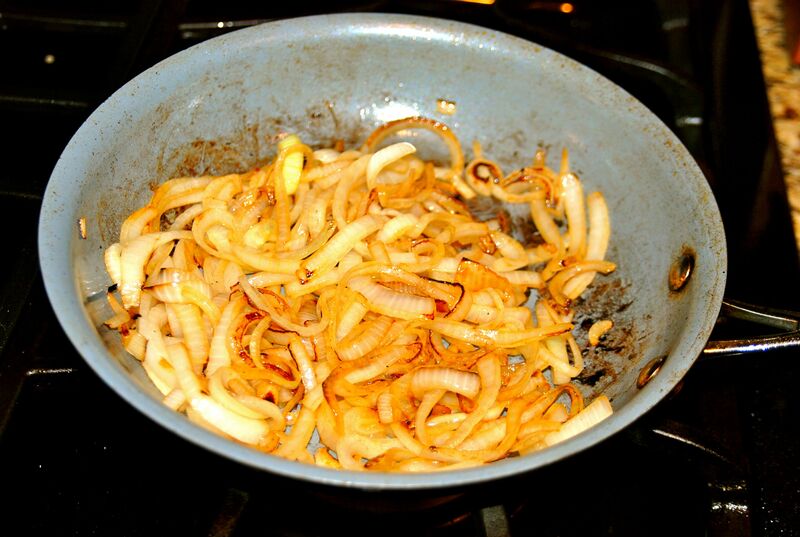 Push the onions around a bit, and allow them to brown up. Now to our chicken. 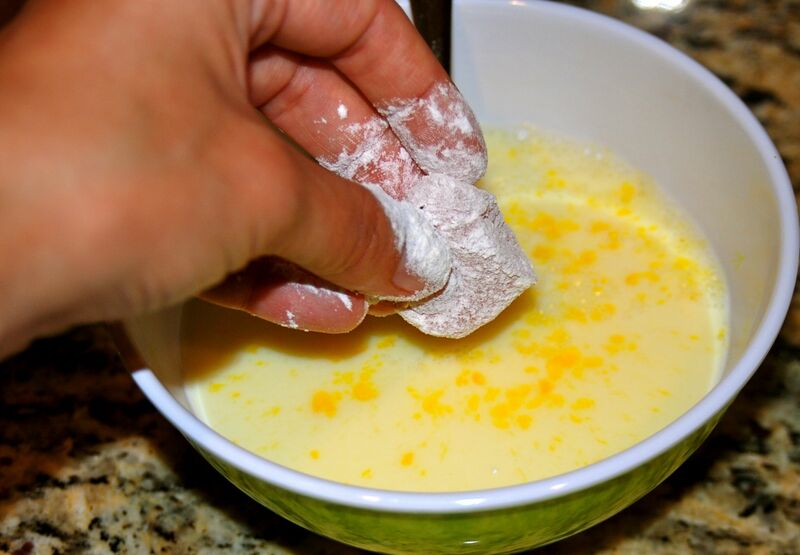 When you pull it out of the pan, let it sit on your cutting board for a few minutes before messing with it. 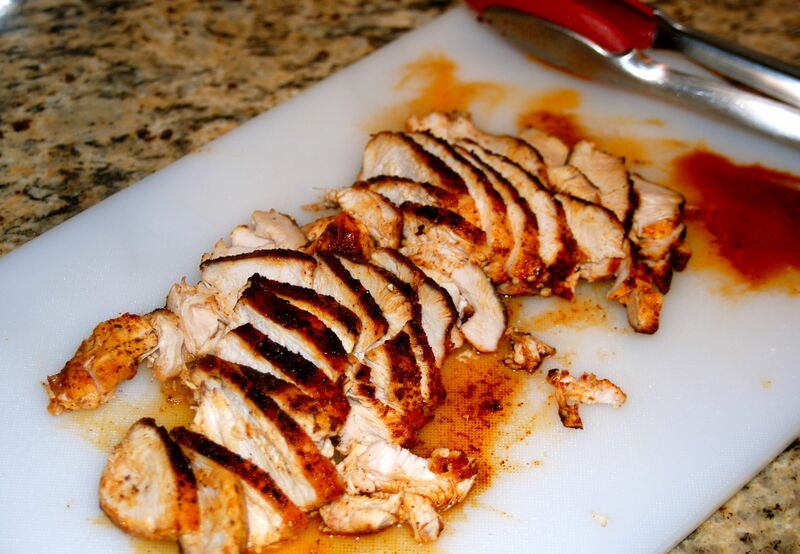 Cutting into the chicken too early will let all of the juices drip out. And we want the juice IN the chicken. 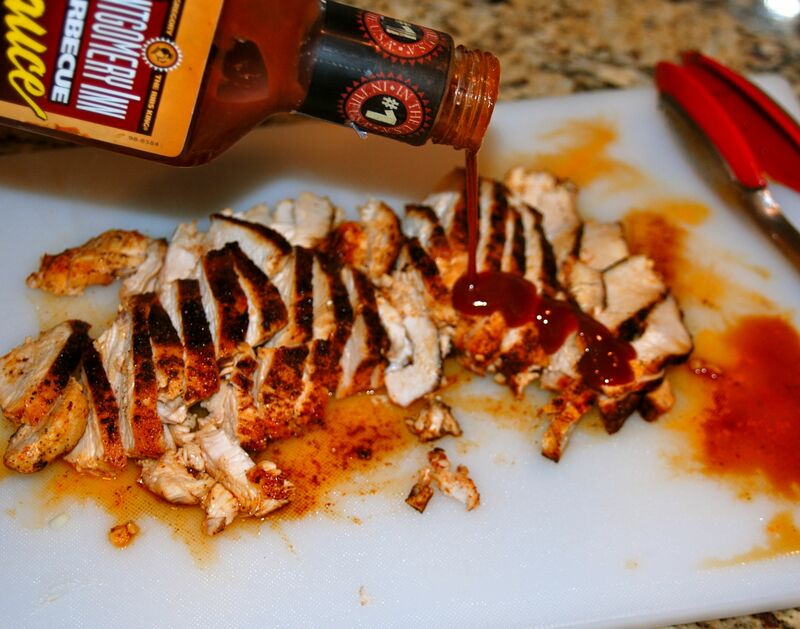 Grab your favorite BBQ sauce. 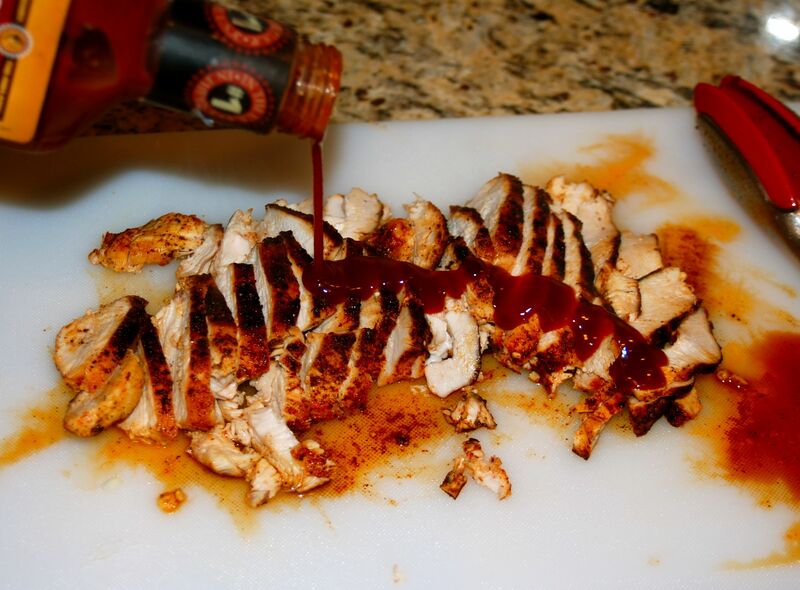 I chose Montgomery Inn BBQ Sauce- a Cincinnati favorite. 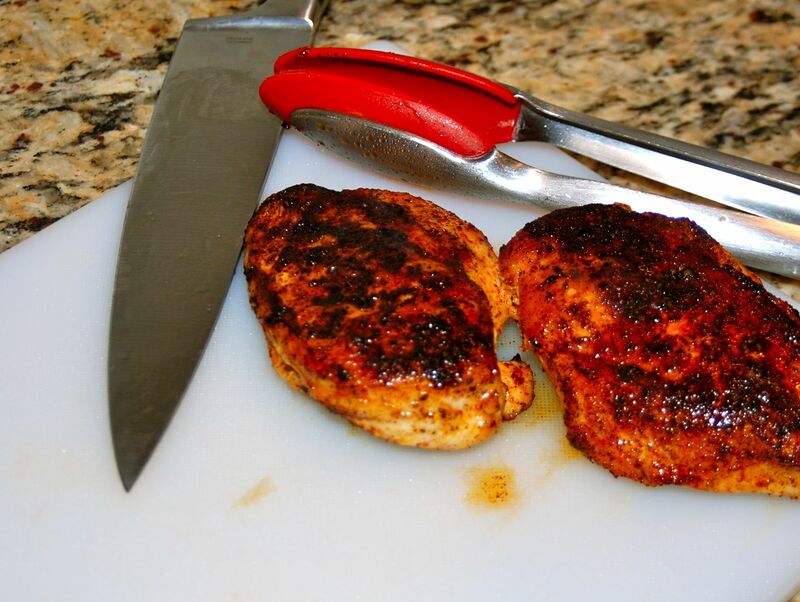 Give your chicken a drizzle while it is still pretty darn hot. 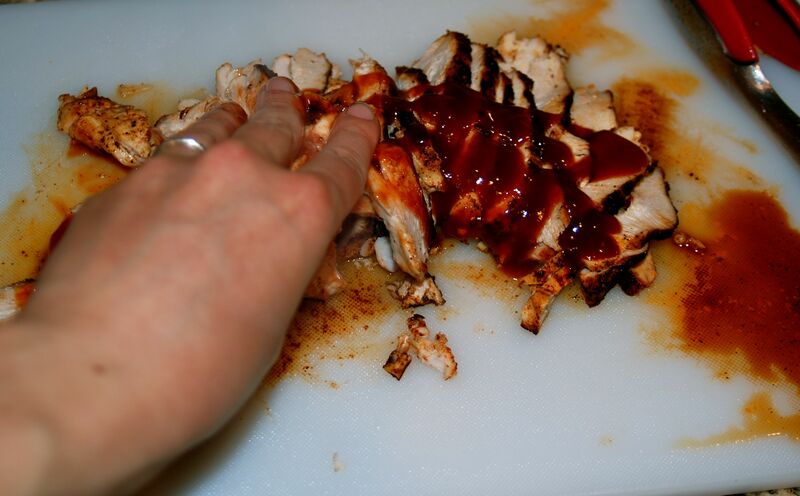 Then, massage the sauce into the meat. 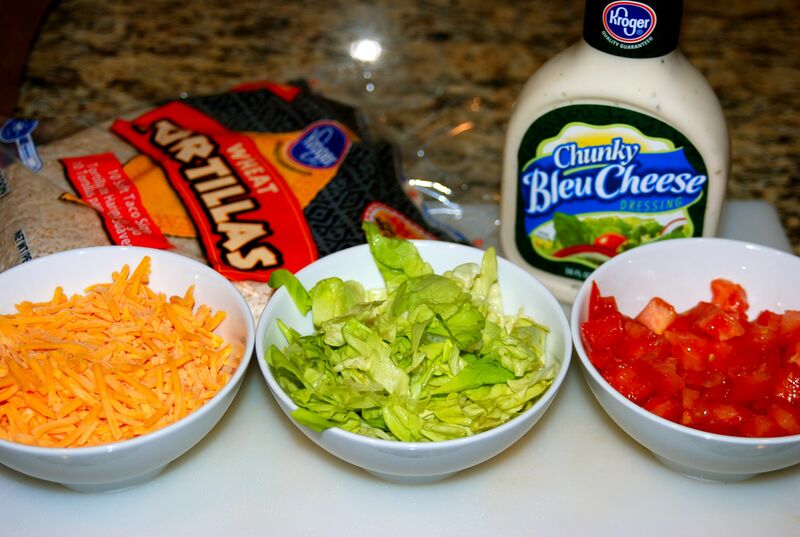 Chop it up even more finely. Onions should be about done now. I put a little sprinkle of salt and pepper on the onions. 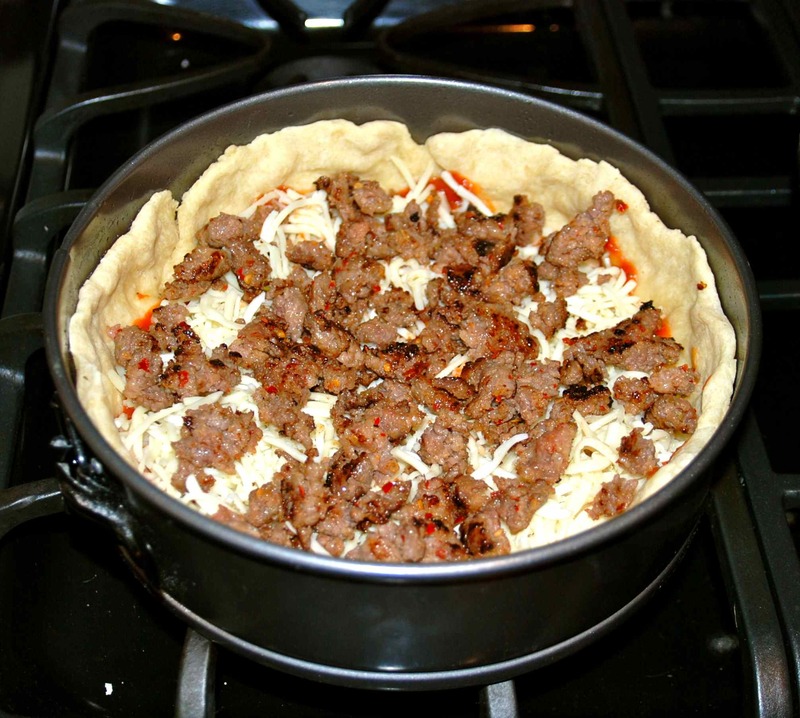 Pile up all of your desired calzone fillings. 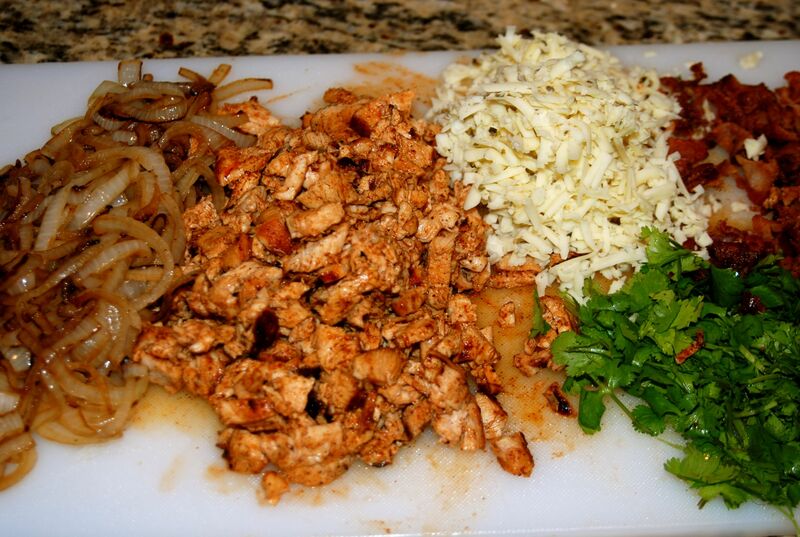 I have sauteed onions, my bbq chicken, some cooked up bacon, shredded pepper jack cheese, and some chopped cilantro. 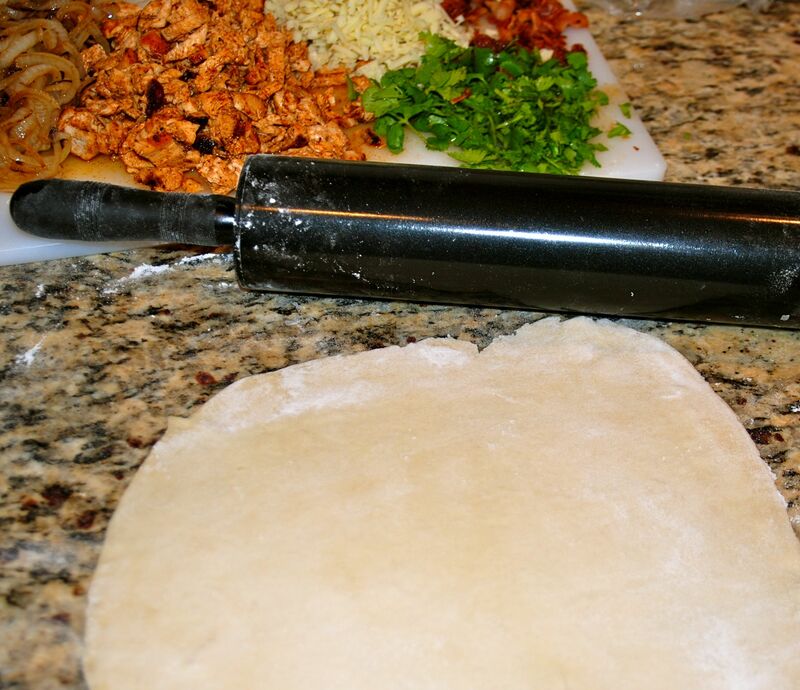 Now take out some pizza dough. 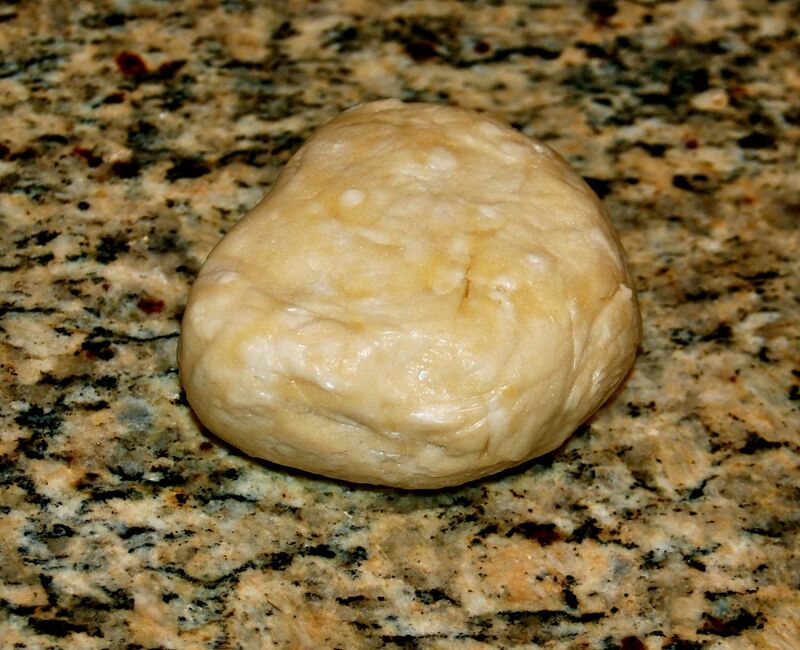 Trader Joes makes a great fresh pizza dough for $.99. That is my store brand favorite. I cut my dough in half. 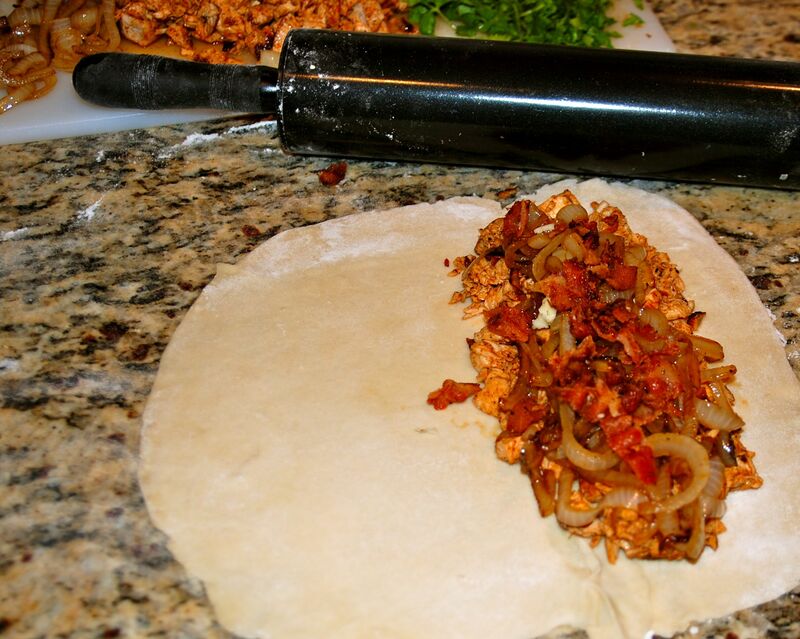 Then rolled out the first calzone. 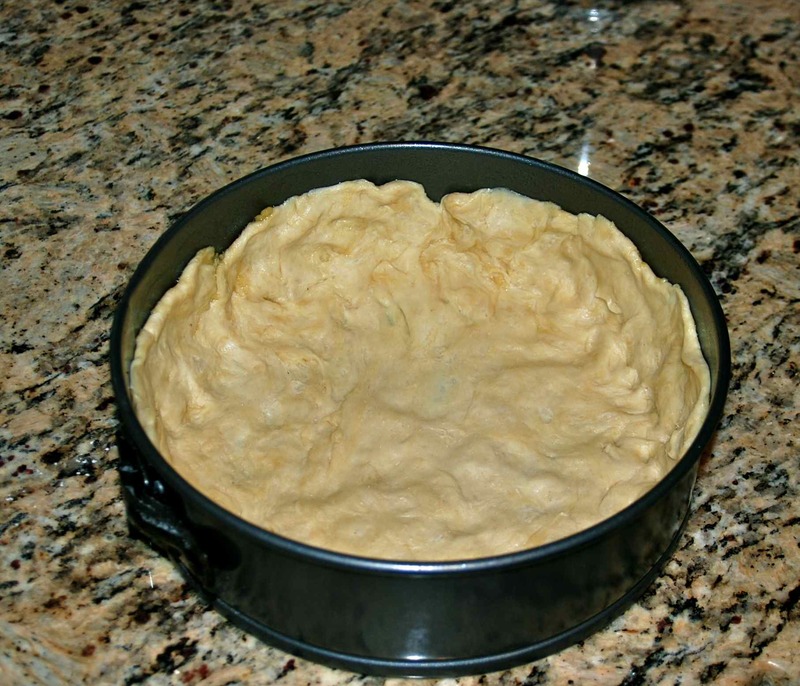 I try to get the dough into a an oval shape. 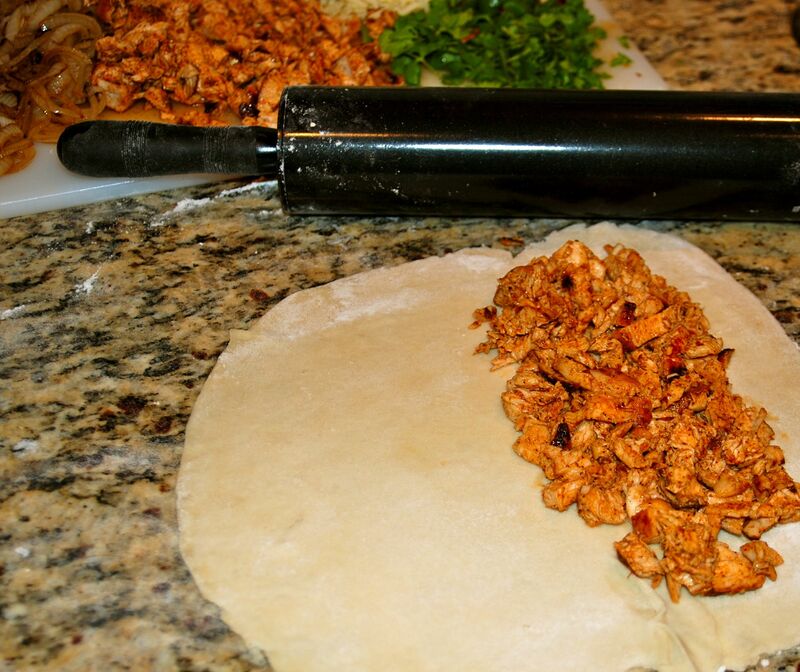 Pile up some chicken on one half of the calzone. 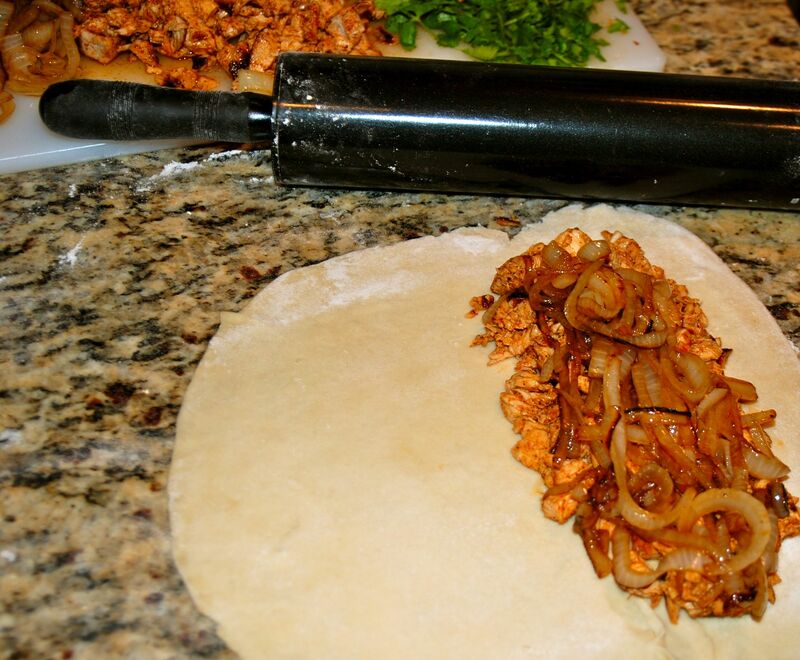 Top the chicken with some onions. 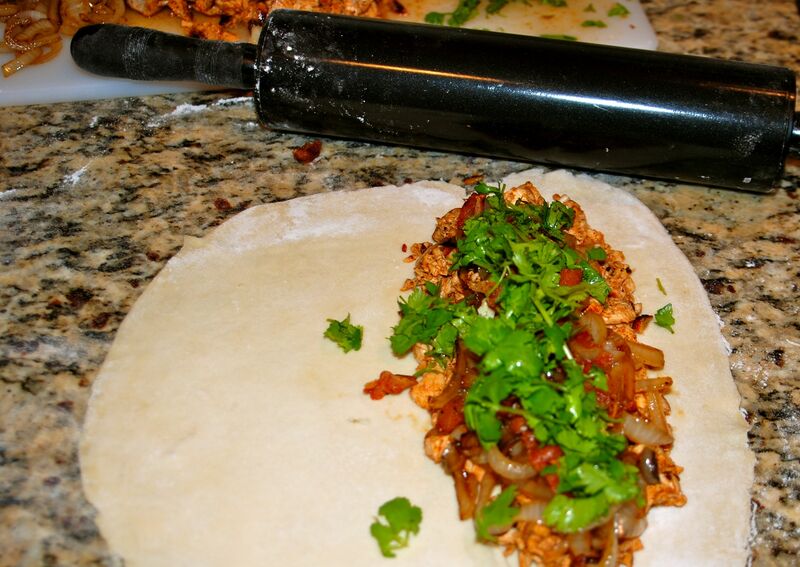 Oooh-eee.. chopped cilantro is next. 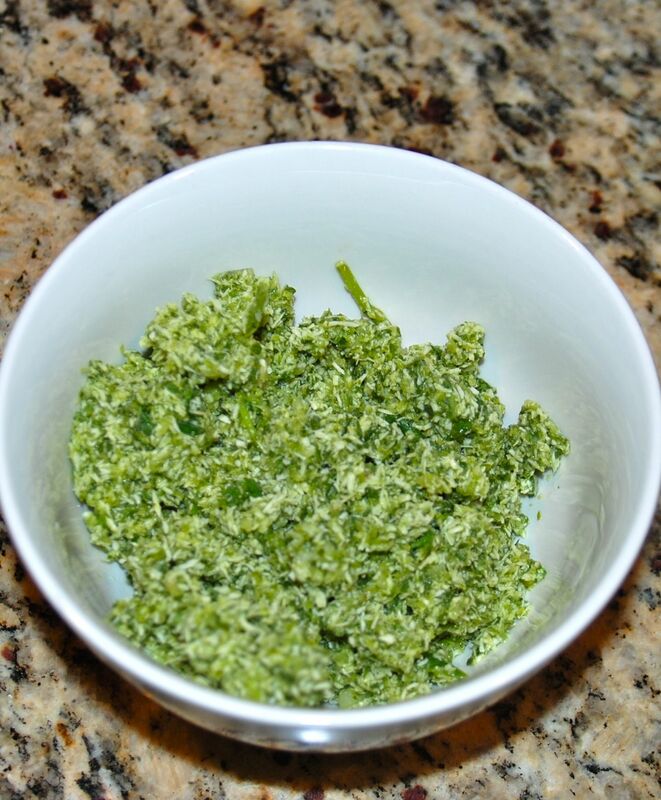 Now, some crazy people don’t like cilantro. If that is you, I’m sorry. 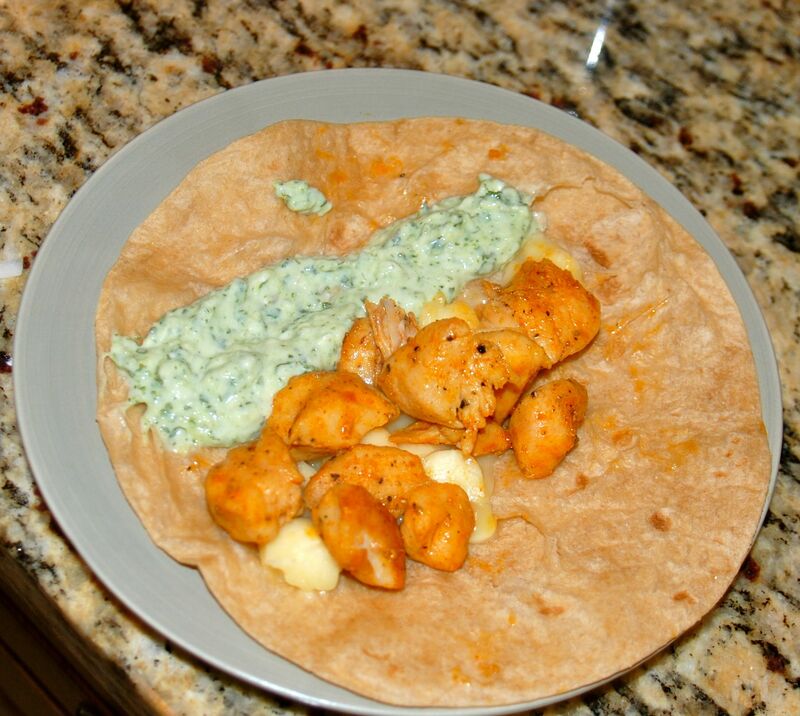 I guess if you don’t like cilantro, you could use some green onion or chives instead. 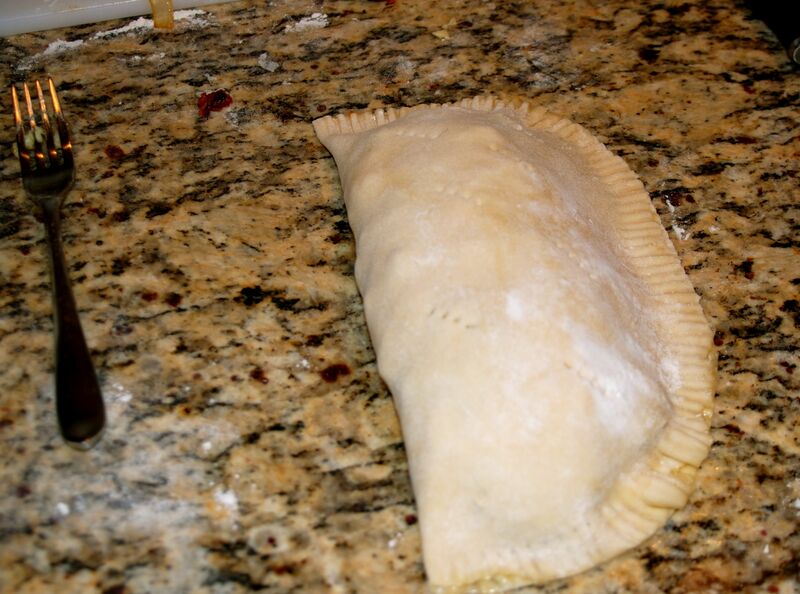 Now, use a little olive oil as your glue to secure the two sides of the calzone together. Use a fork to seal it up. 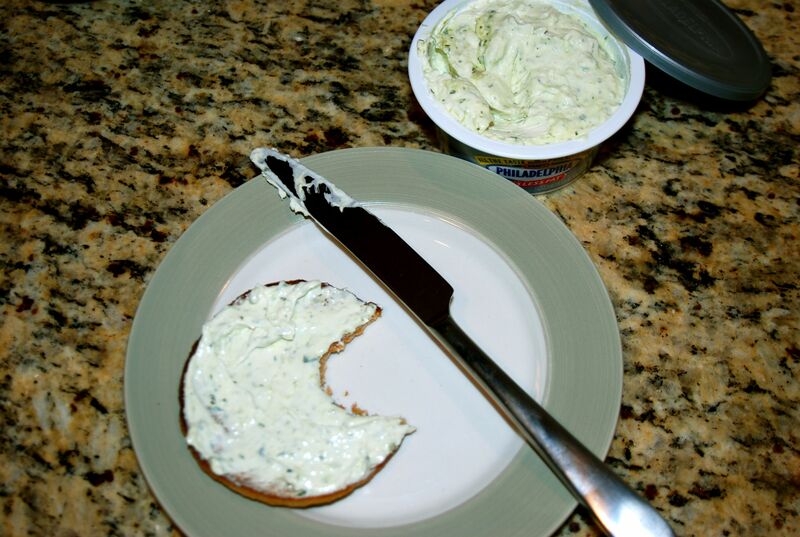 And then trim any extra dough off of the edge. 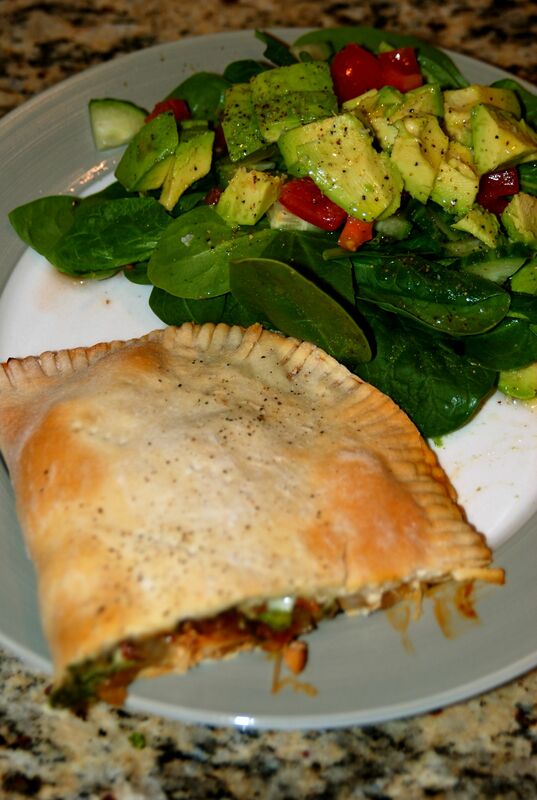 Give the top of the calzone several pokes with a fork to allow steam to escape while they are baking. 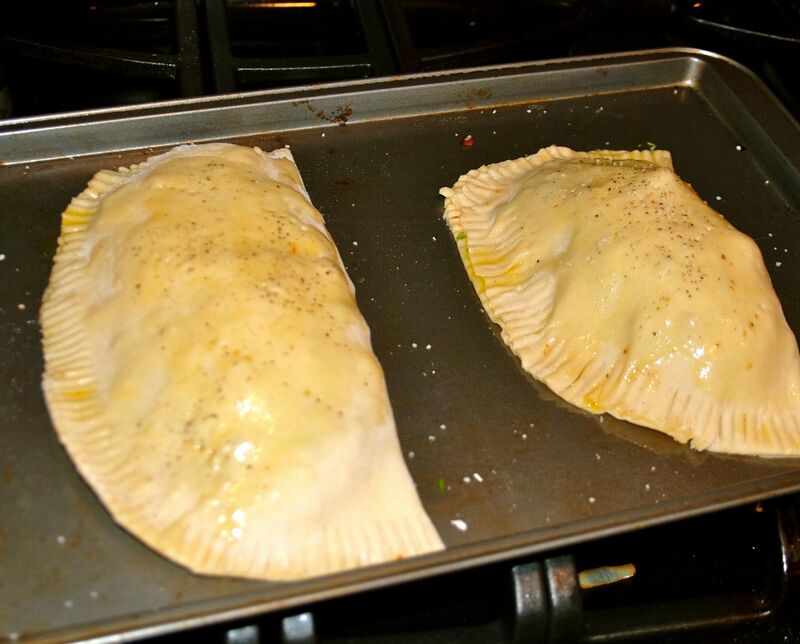 Put your calzones on the a non-stick pan. 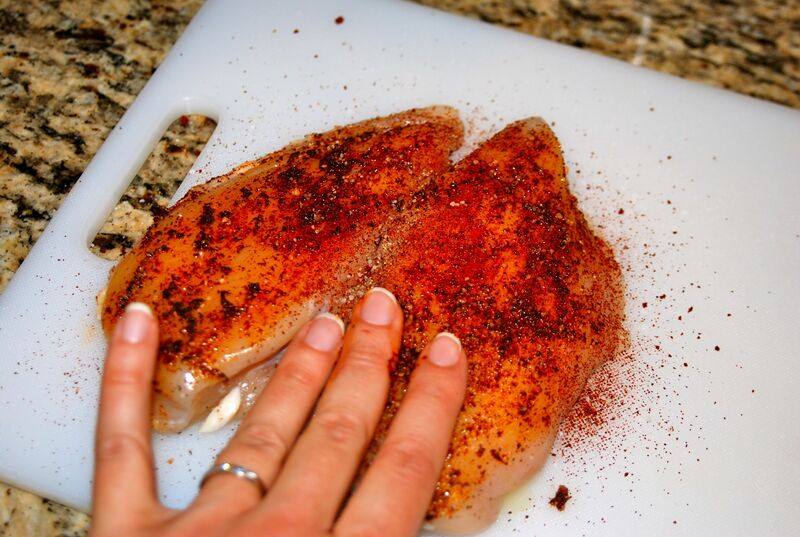 Give them a brush of olive oil, and give it a sprinkle of salt and pepper. 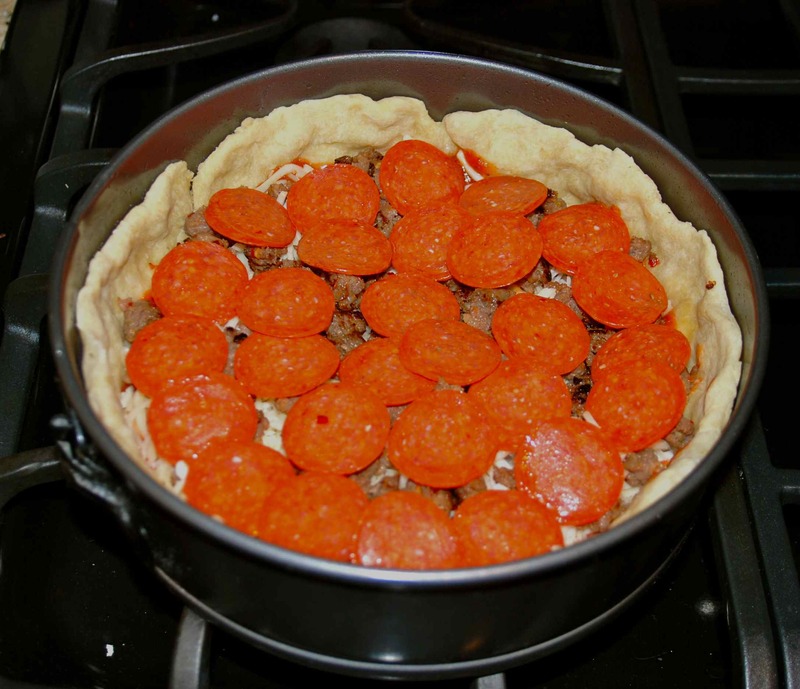 Pop it into the oven for about 20 minutes. After 20 minutes, the calzones come out browned and beautiful. 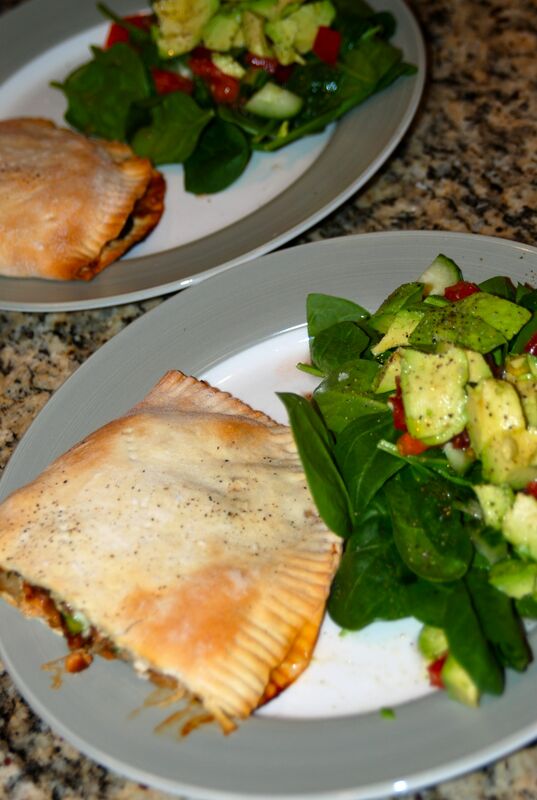 A half of a calzone was the perfect serving size. The perfect pairing? A big green salad. Have a great weekend pals. I am going to be like Bob and Jillian to the folks on Biggest Loser. I am going to be like Jack LeLane to the juicing world. I am going to be like Mark Zuckerberg to the world of social networking. 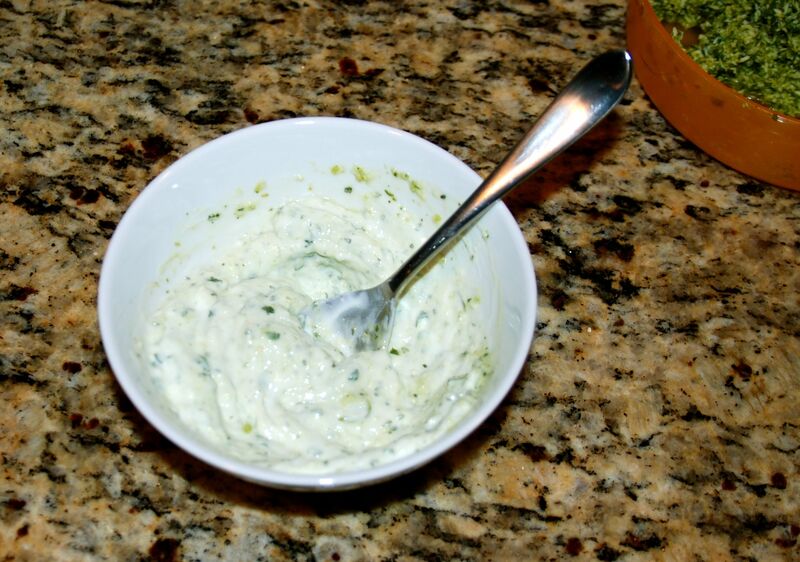 I am going to introduce you to Cilantro Chutney. I have no clue how I only discovered this delightful delectable deliciousness over the past weekend. 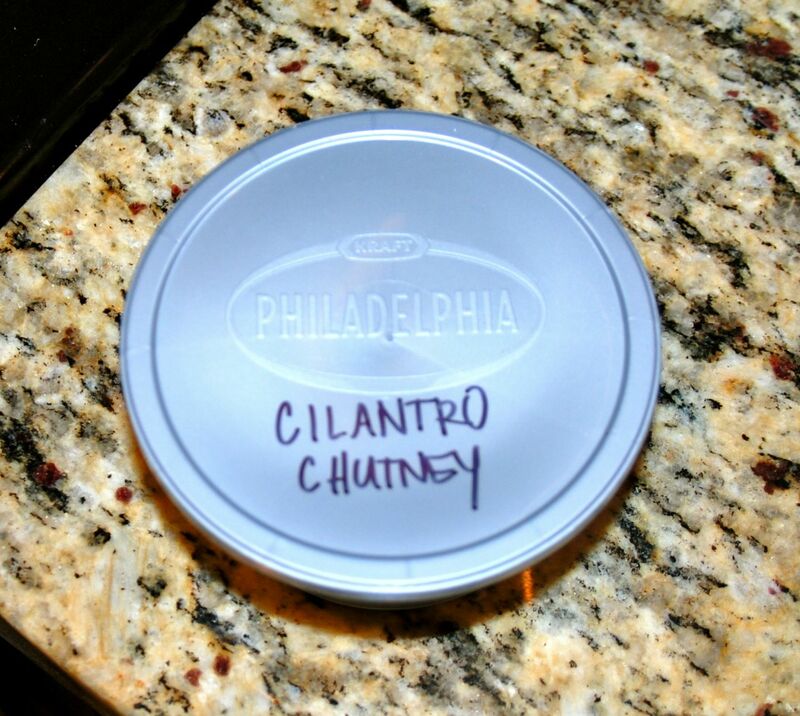 I am angered at the unjustness of the world that Cilantro Chutney has been withheld from me until now. And I am forever grateful to my dear Dr. Sister for introducing me to it. The chutney recipe actually comes from my sisters boyfriend’s momma. And for the rest of my life, I shall owe her a huge debt of gratitude. 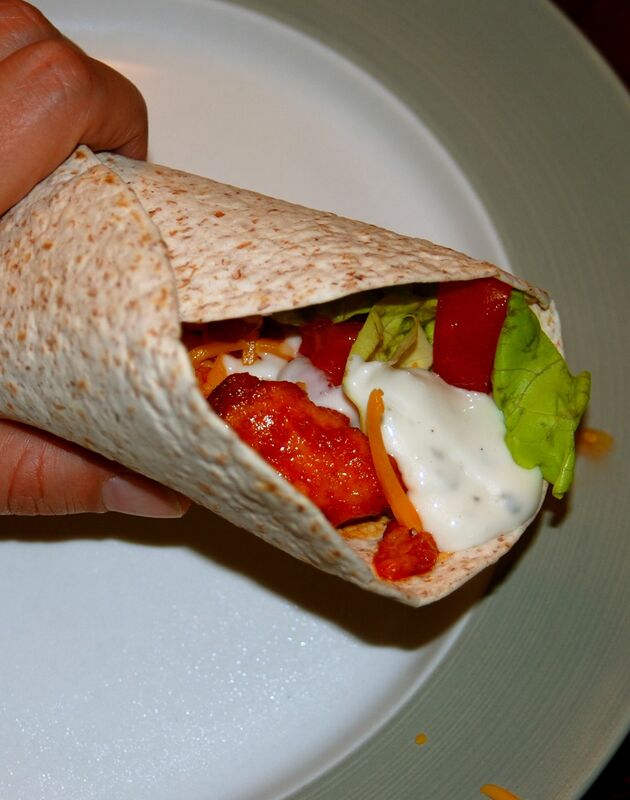 I’ll tell you how I have been enjoying this yummy, spicy, sweet, savory treat. 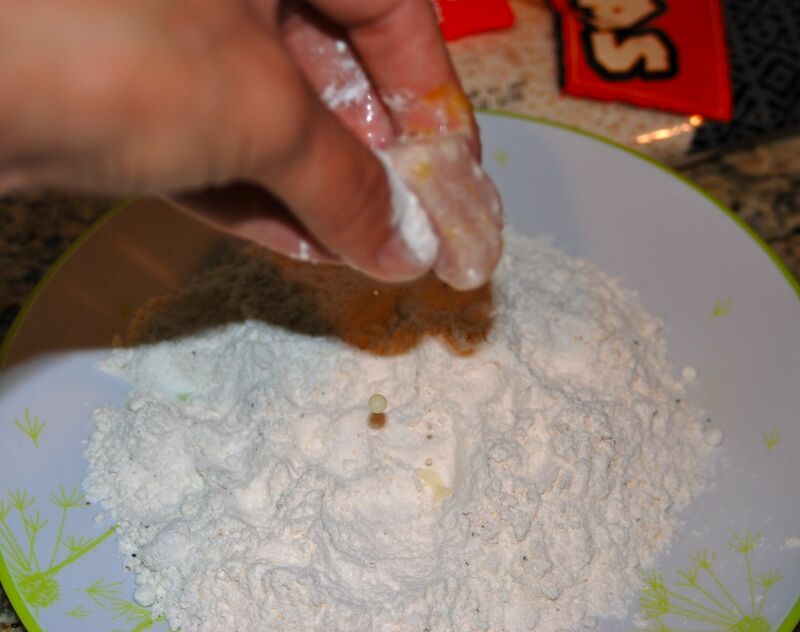 Dump it into a bowl with a couple of huge tablespoons of the chutney. Store it in the same container it came in- yay for recycling. 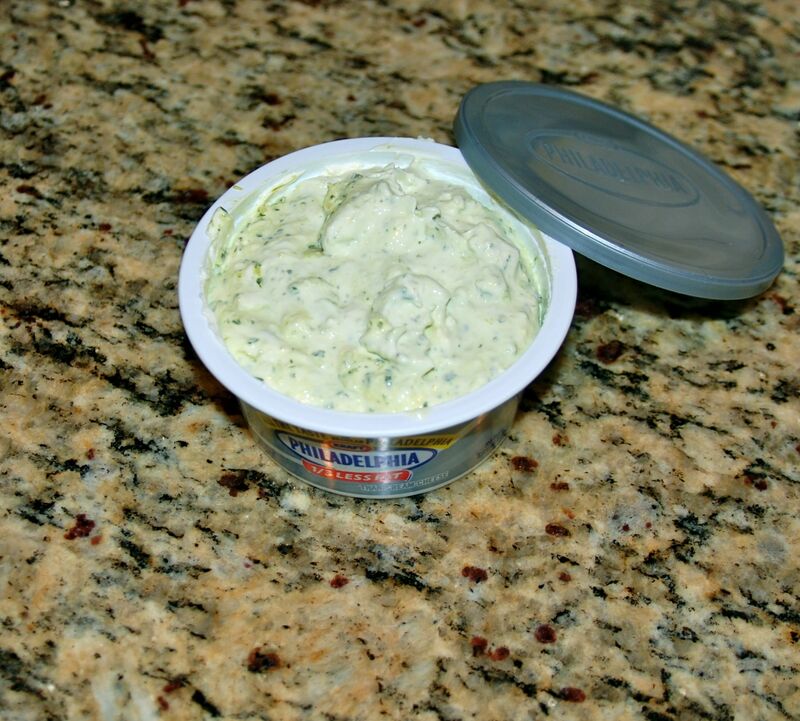 Slather some of that on toasted goodness. Or on a turkey sandwich. Slap a label on it so you can find it easily time and time again. 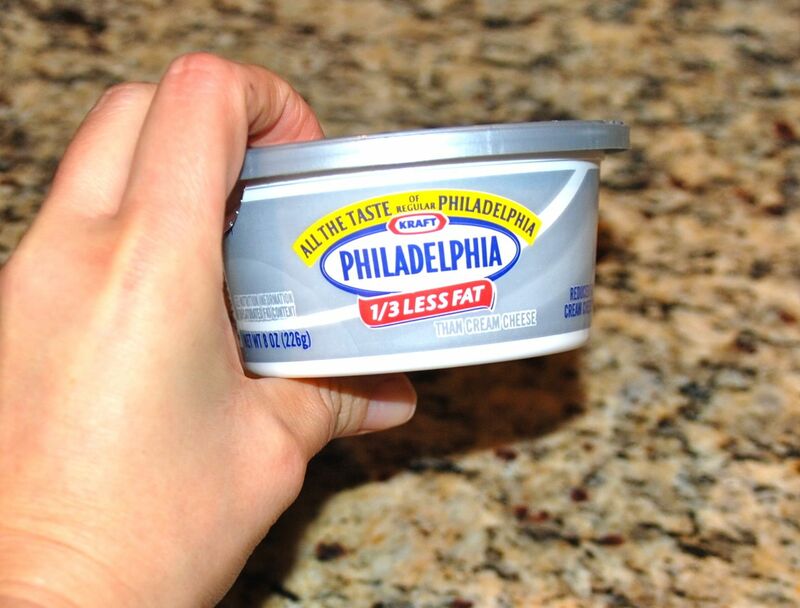 This will not last long in your fridge. 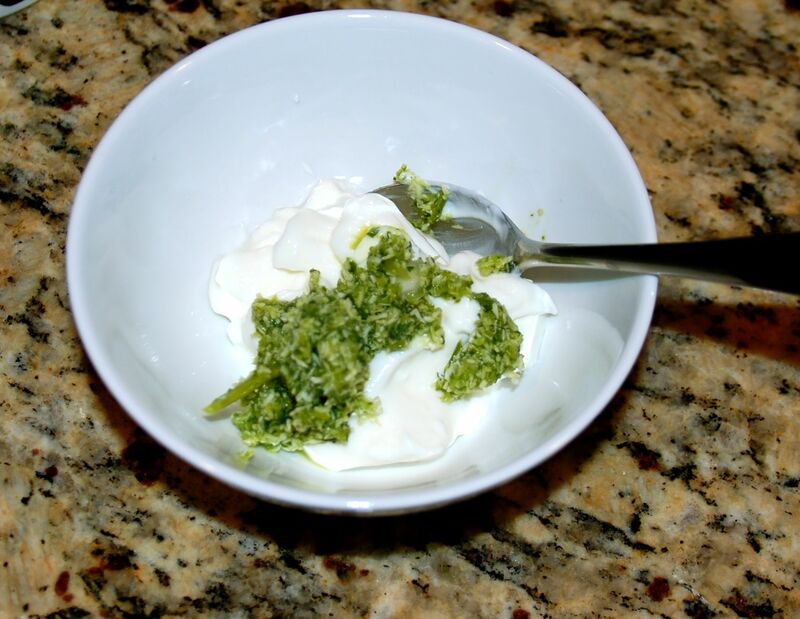 Toss a little (1/2 c.) in a bowl and top with a heaping tablespoon of the chutney. 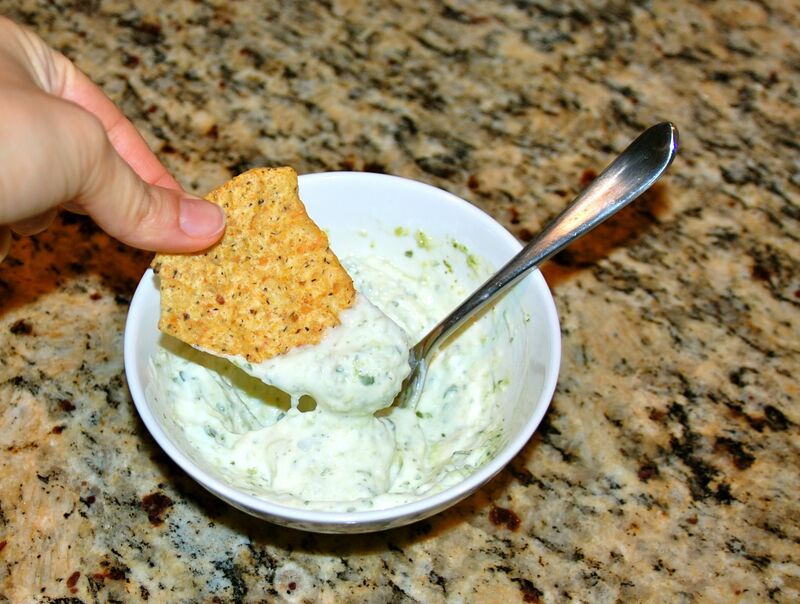 Then, take a corn chip and dip it! 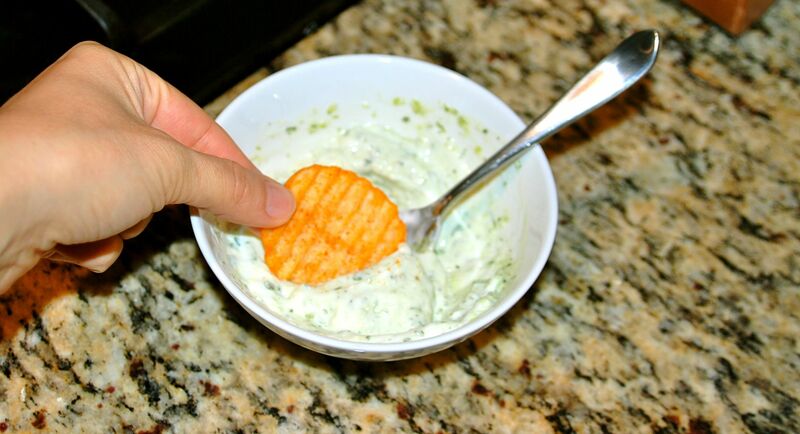 Or, use my husbands favorite chip to dip… the BBQ chip! 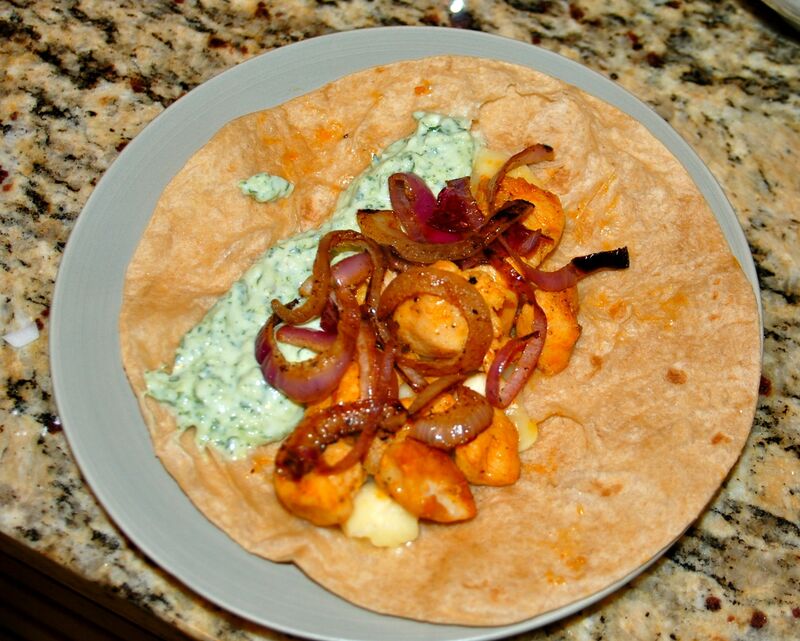 This combo is especially tasty because the spiciness of the BBQ chip pairs perfectly with the bright cilantro and sweeter coconut flavor of the chutney. 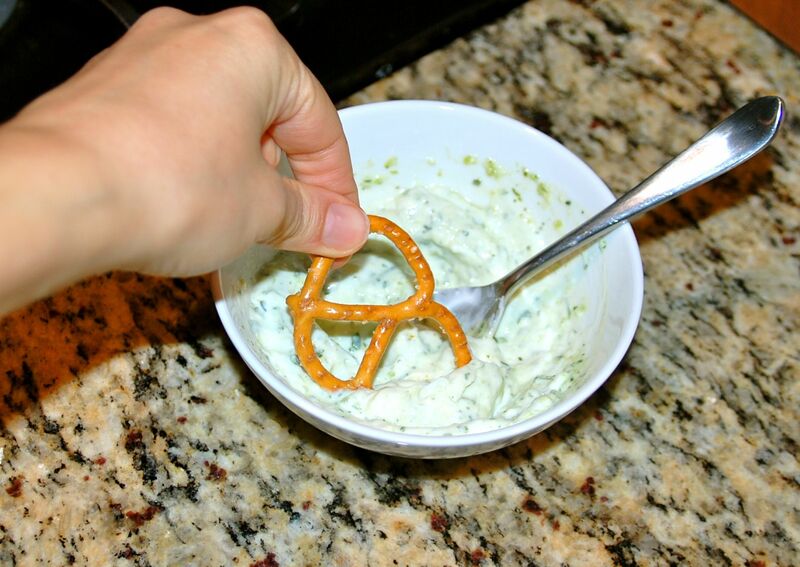 Of you can use the old standby for dipping… the pretzel! Use it to make a yummer yummer in my tummer dinner. Fry some bacon (6 pieces for dinner for 2 plus a portion for leftovers). 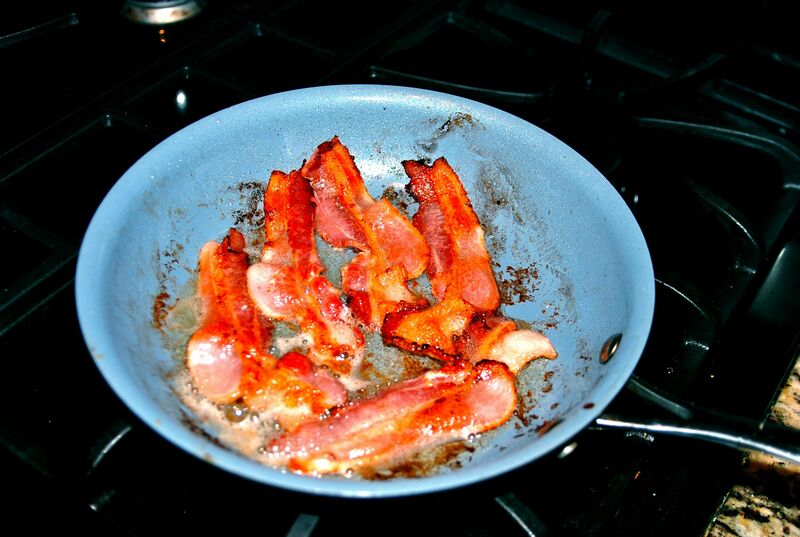 Drain that pan of the bacon fat. Slice half of an onion. I used red, but you can use whatever you’ve got! 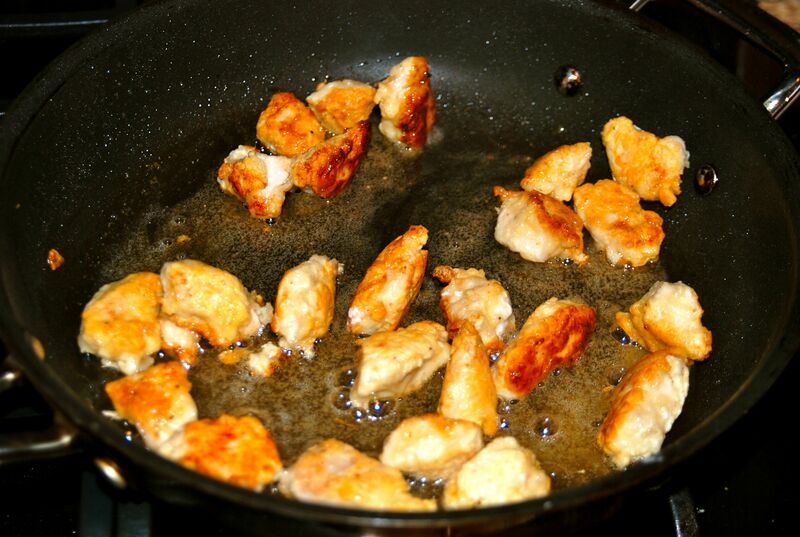 Drop that in your hot pan to caramelize and cook. 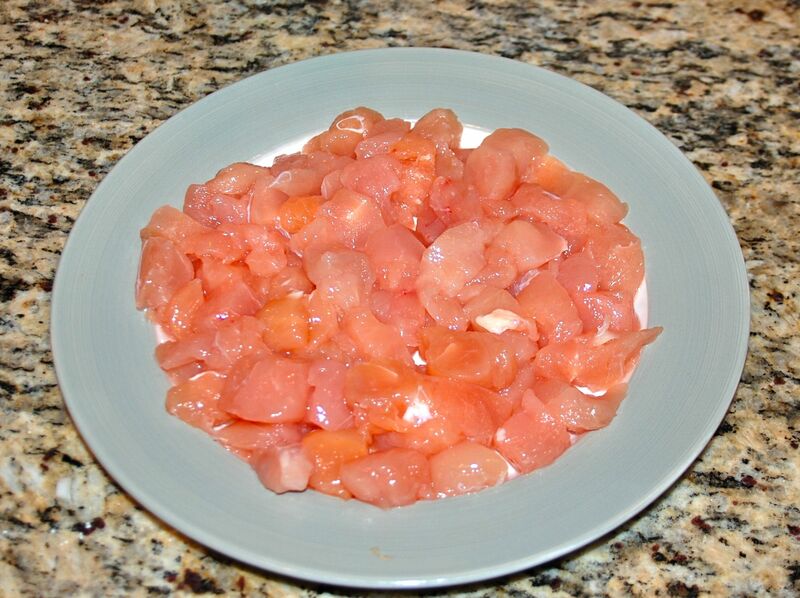 Put some chicken breasts or chicken tenders on a plate. I had left chicken defrosting in the fridge all day, and it was not close at all to being 100% defrosted when I was ready to use it. 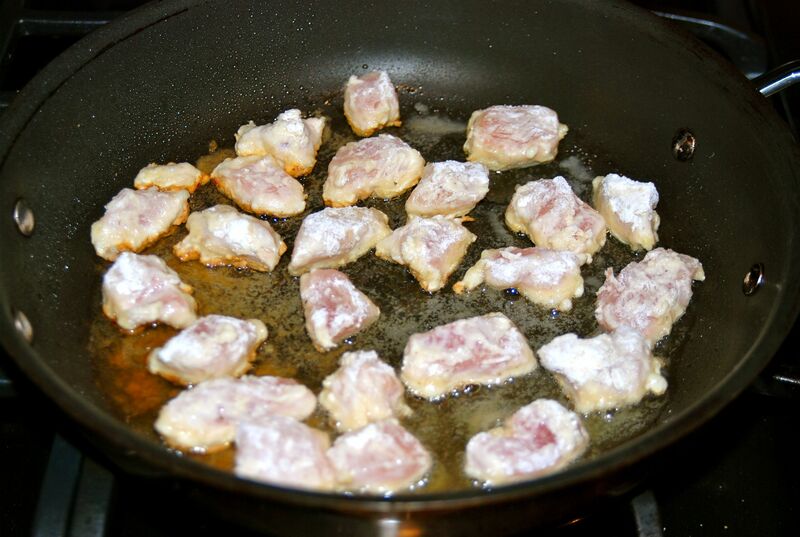 So, I cheat the defrosting process along by chopping the chicken into bite sized chunks. 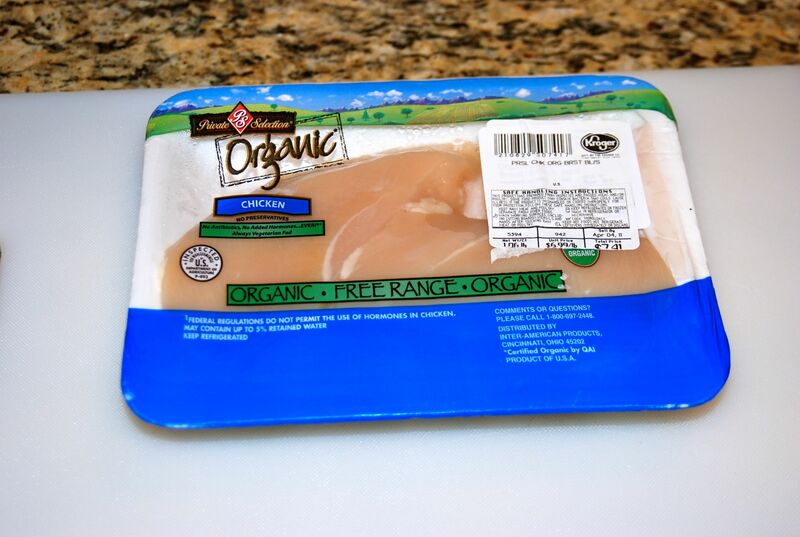 Within minutes, the chicken is thawed. 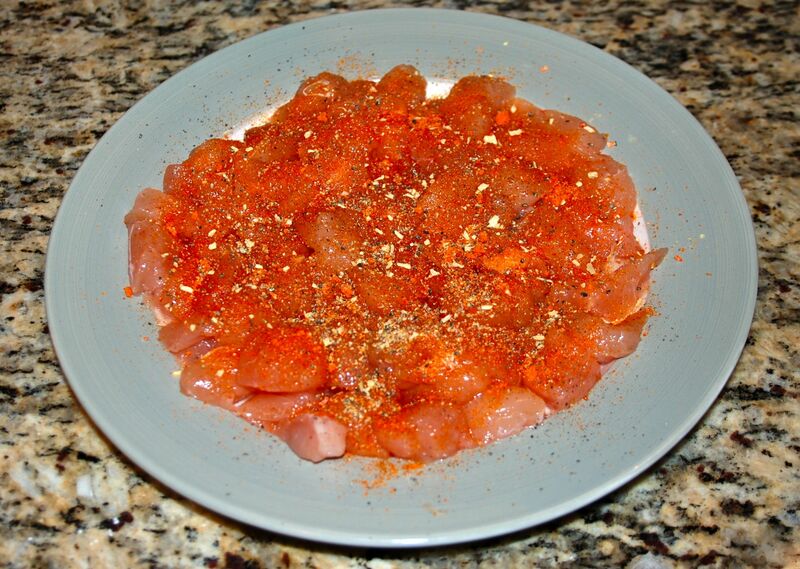 Sprinkle on some seasoned salt and lemon pepper (there is lemon juice in the chutney, and the lemon pepper chicken pairs great with that!). 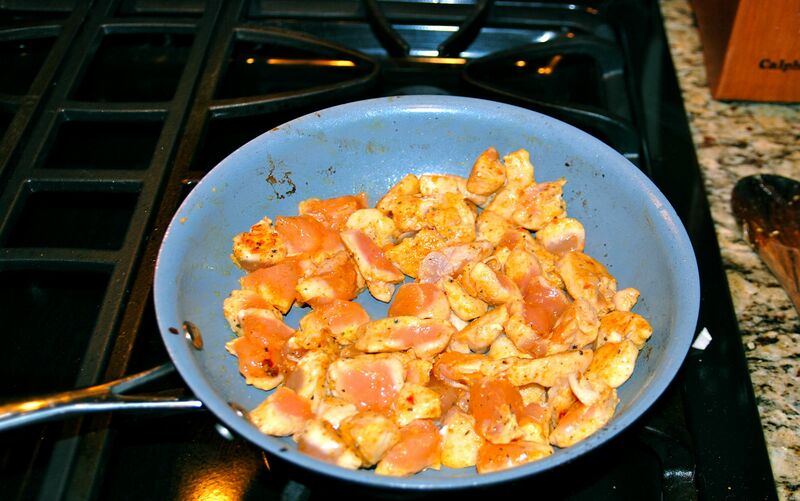 Toss that chicken into the same pan that had cooked your bacon, then onions. 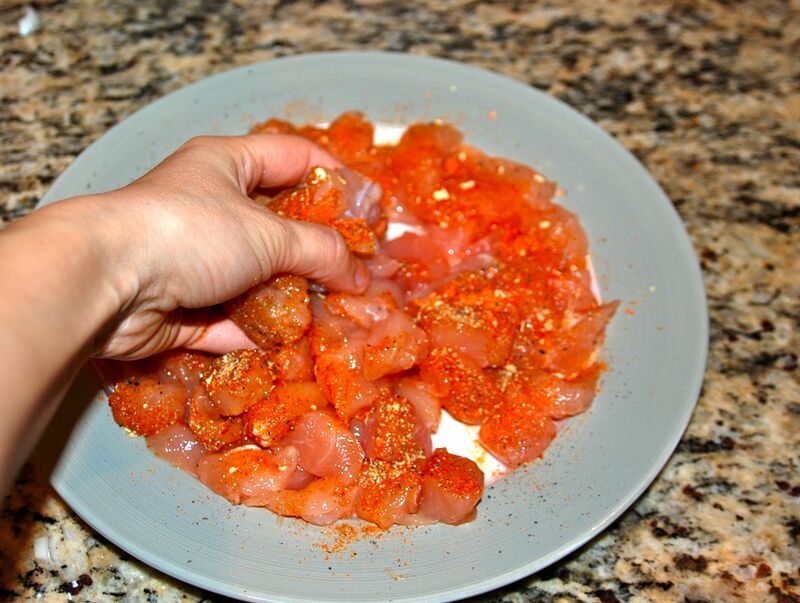 Make sure you have washed your hands thoroughly after handling all of that raw chicken. 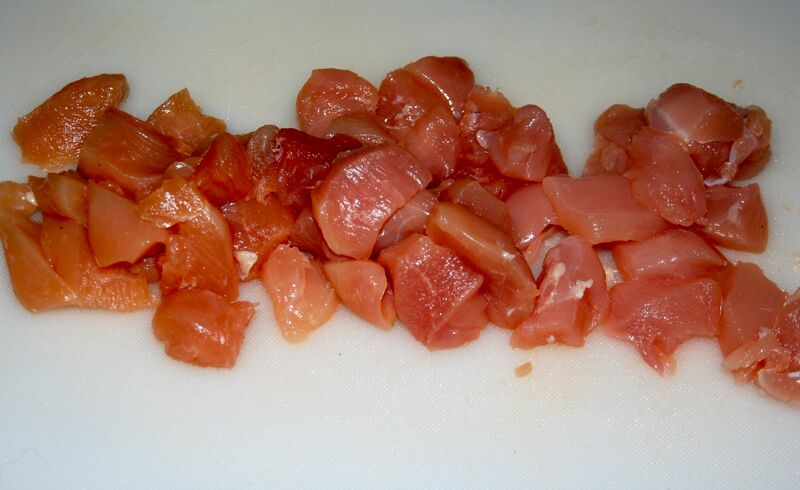 If you use the pre-sliced chunks o’ chicken, they will cook pretty quickly. 3-5 minutes, and they are done. 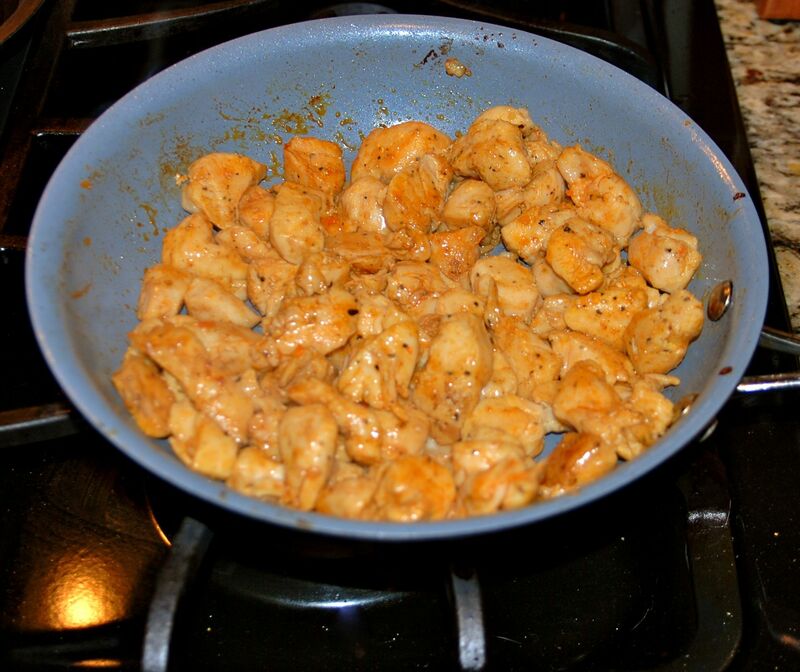 Right before pulling the chicken off of the heat, I added in a few dashes of worcestershire and hot sauce. 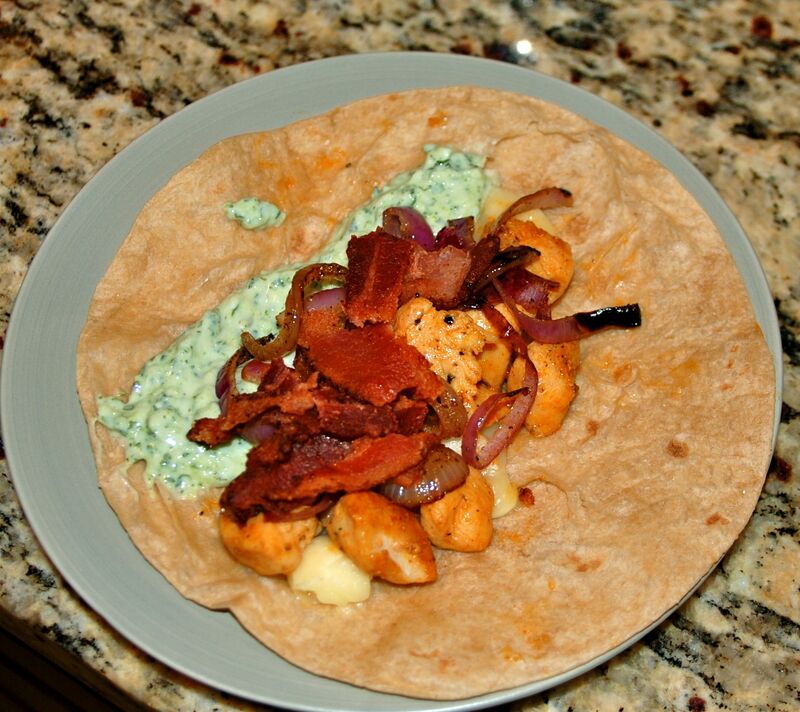 Grap a wrap or tortilla (or bread or bun or whatever you have on hand). 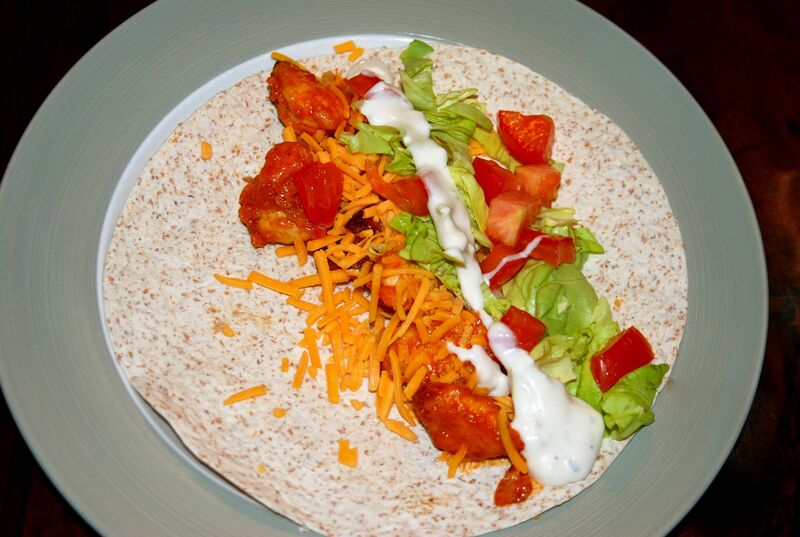 Put down a sprinkle of cheese and then top that with your hot chicken. 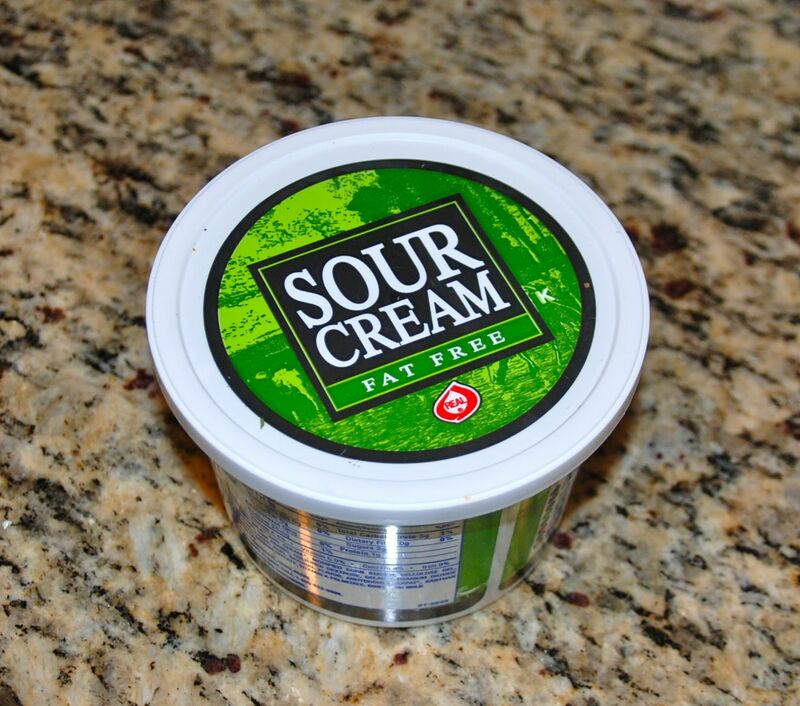 Grab your sour cream/chutney sauce. 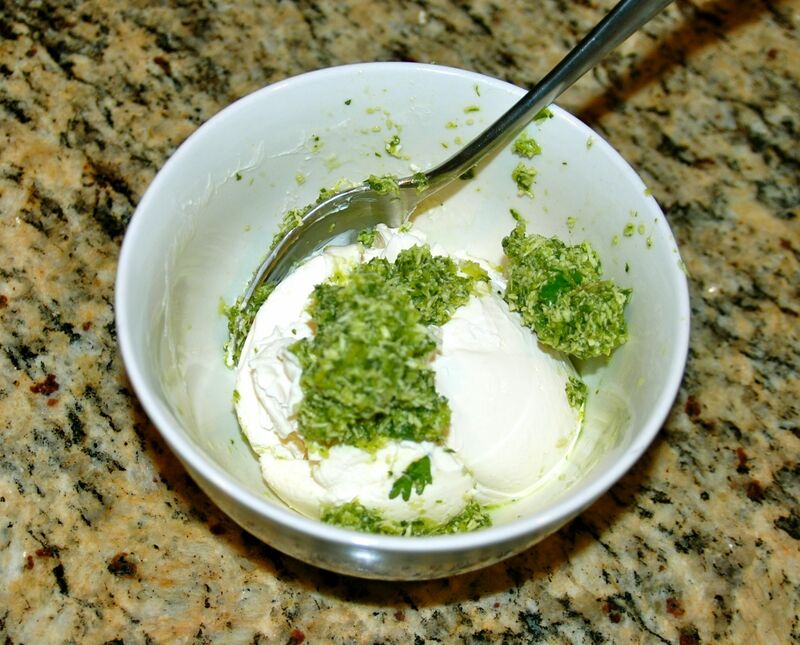 I actually added another tablespoon of the chutney to make the flavors even more pronounced. 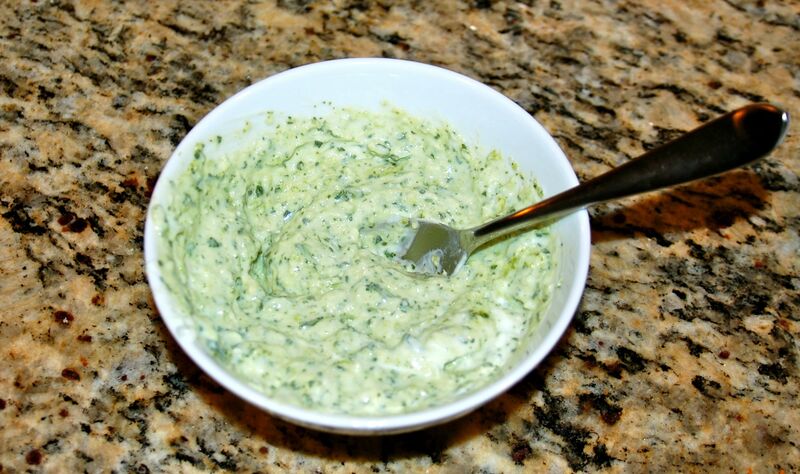 Slather some of that on your sandwich. 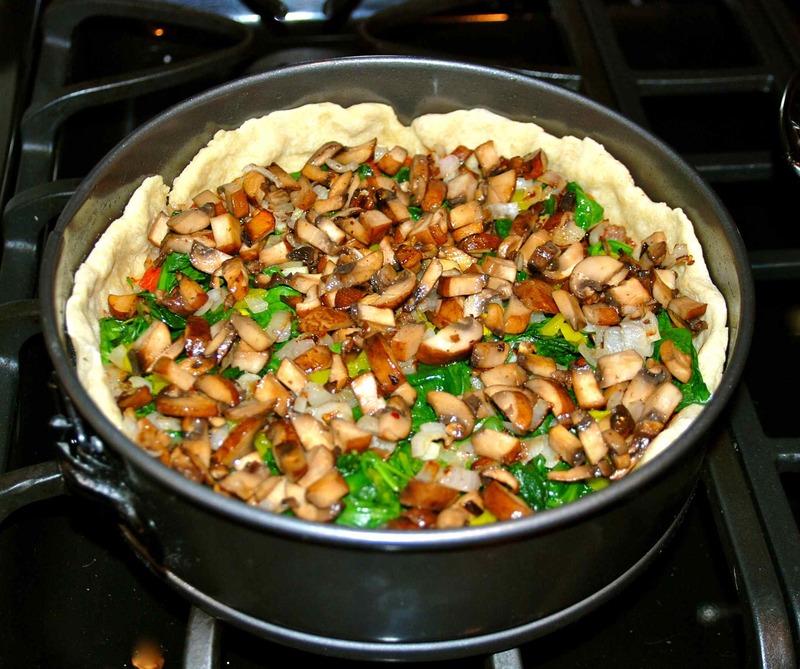 Top with some of your caramelized onions. 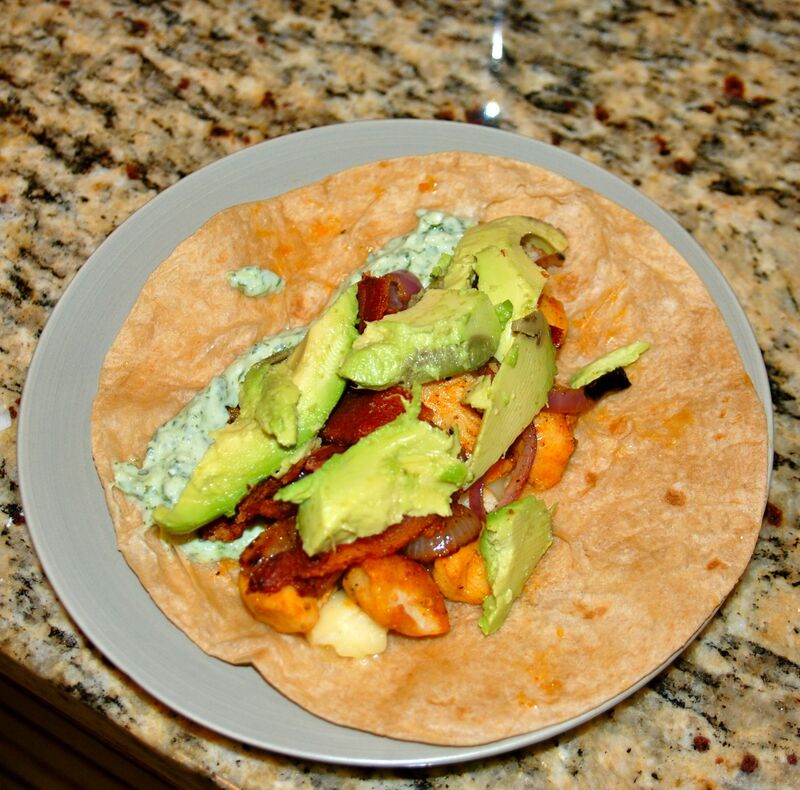 I happened to have a perfectly ripe avocado, so I threw it on too! I served it with green beans from a can. CONFESSION: green beans from a can are my secret vegetable pleasure… although, I’m pretty sure there isn’t a whole lot of nutritional value left in them when they turn that canned shade of green. 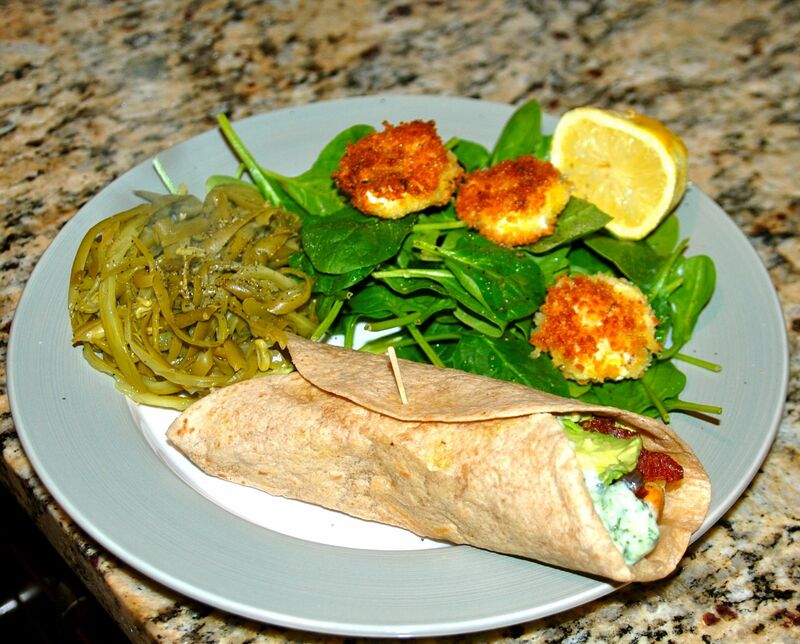 And I also made a simple spinach salad with fried goat cheese rounds on top… that recipe is coming tomorrow! I know cilantro is not for everyone. 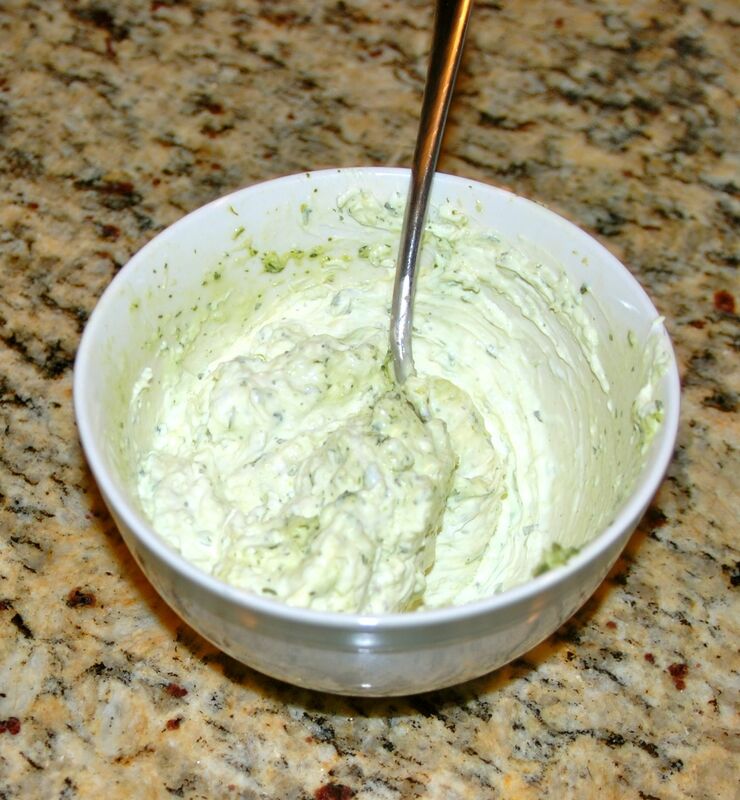 However, if you are like me and love the stuff… you cannot live one more day without cilantro chutney in your life. 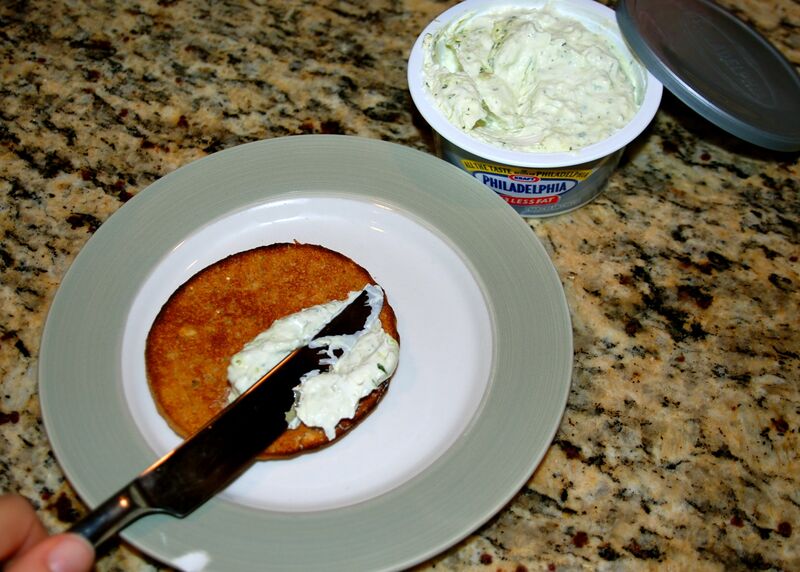 For if you do, you will certainly look back with regret on all of the time lost living without the chutney.